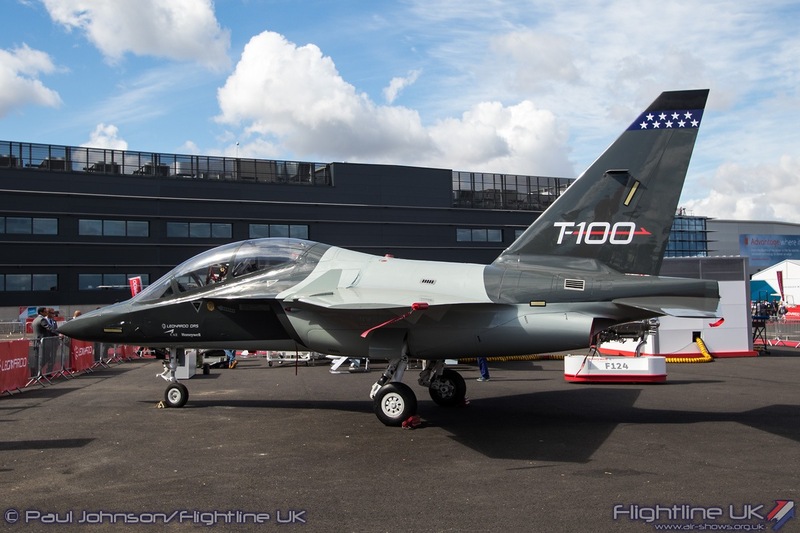 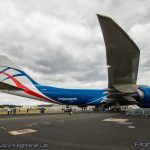 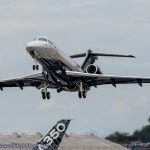 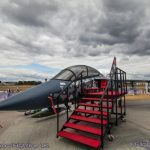 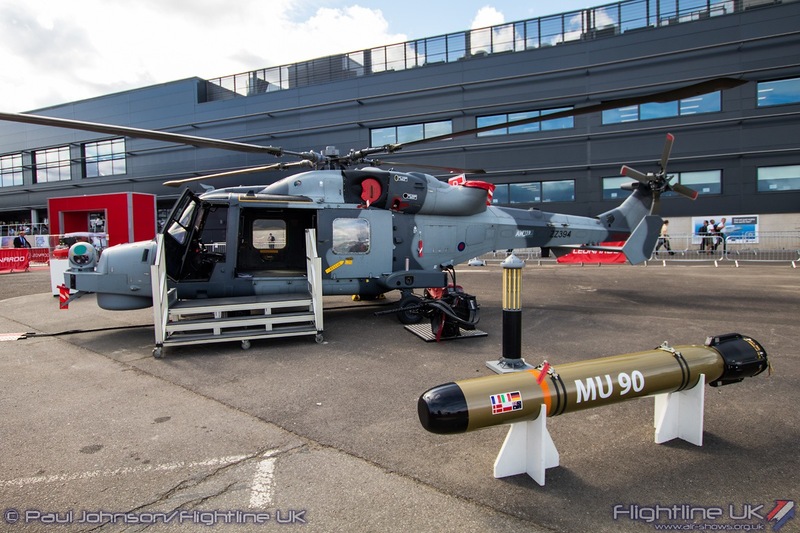 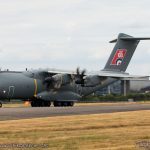 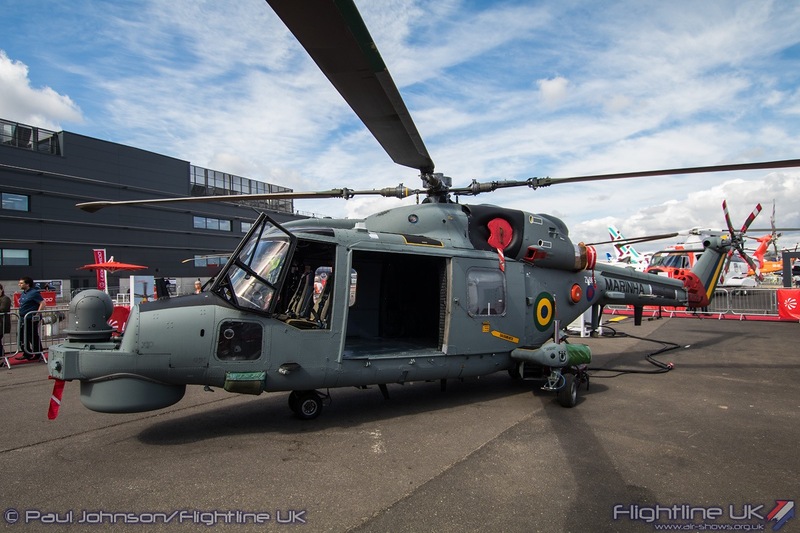 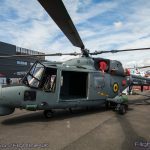 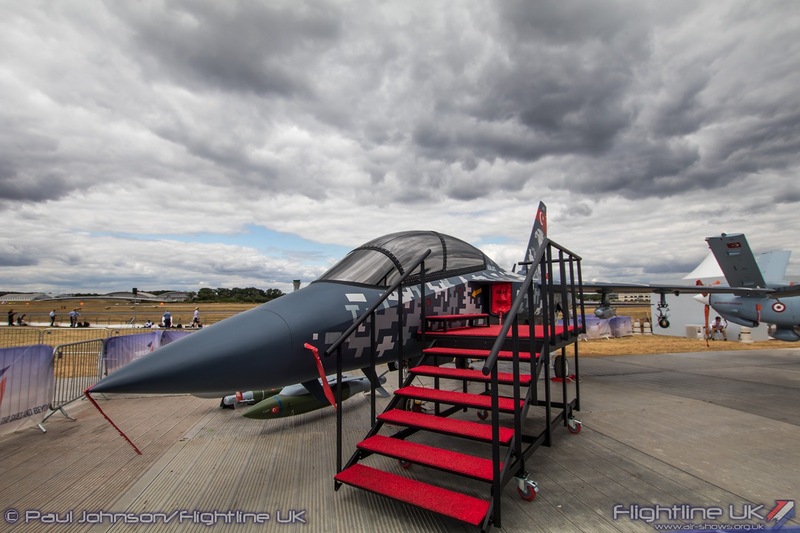 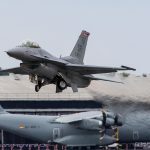 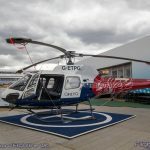 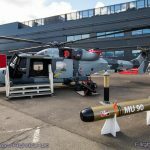 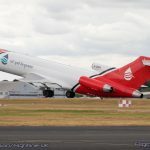 2018 was another big year for the Farnborough International Airshow during the trade days. 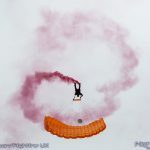 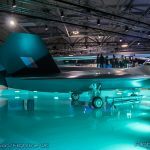 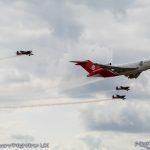 Orders announced at the airshow topped $192 billion as Farnborough showcased its brand new permanent “Hall 1” facility. 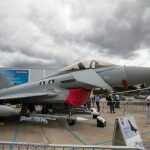 The show brings together the entire aerospace industry with exhibitors and visitors representing the manufacturers, airlines, military and government delegations plus the space industry for a ‘trade week’ which runs for days. 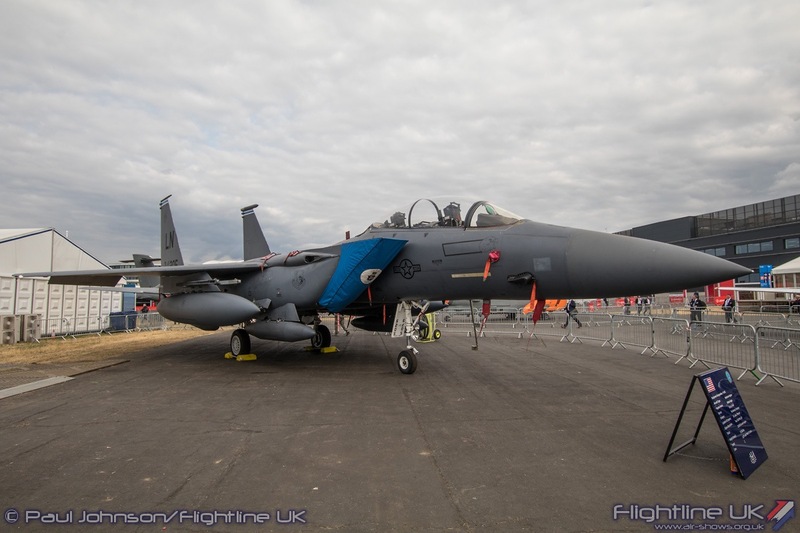 As well as the exhibtions, there is also a large static display of aircraft and the traditional afternoon flying display featuring aircraft from around the world. 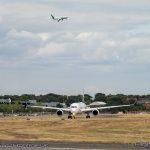 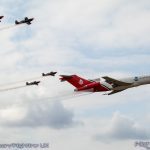 The Farnborough Airshow is famous worldwide as one of the biggest aerospace trade shows and celebrated its 70th anniversary in 2018. 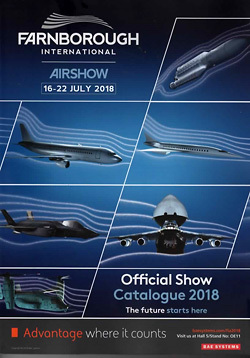 The show has changed from a shop-window on the UK aviation industry to a major exhibition hub for the global aerospace community. 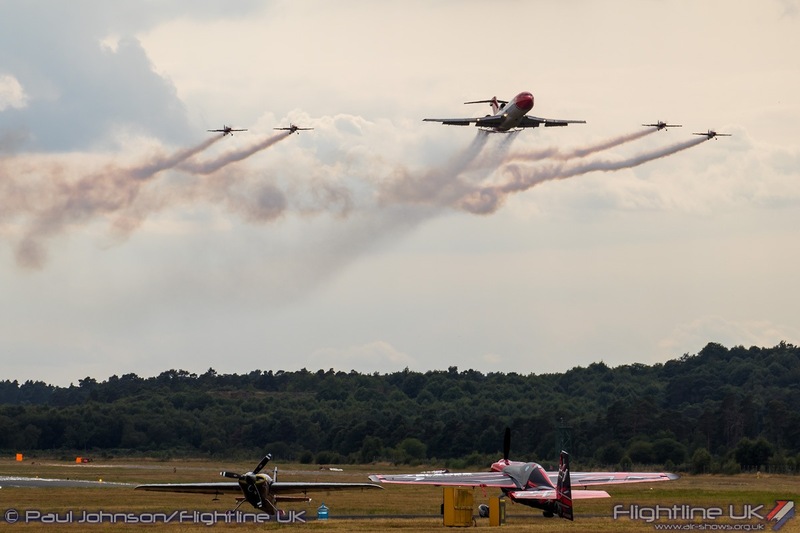 This year saw over 100 countries represented in the attendance and a record presence from the Chinese. 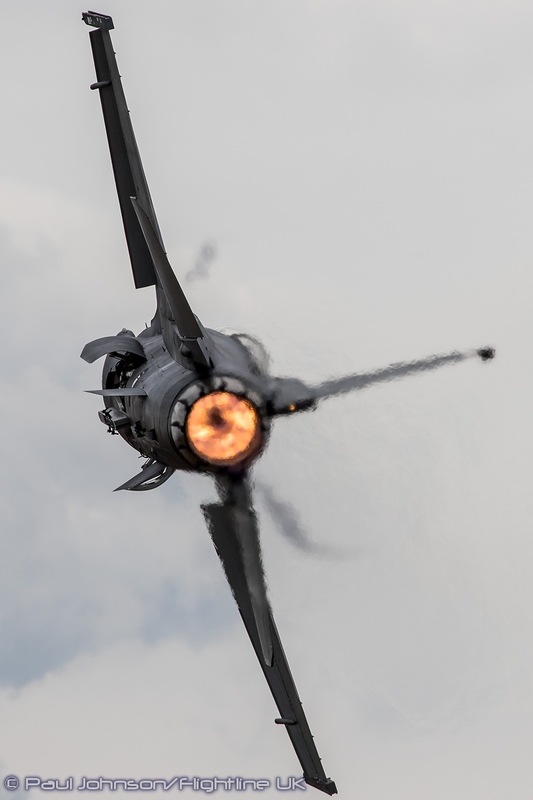 It was an incredible year for orders. 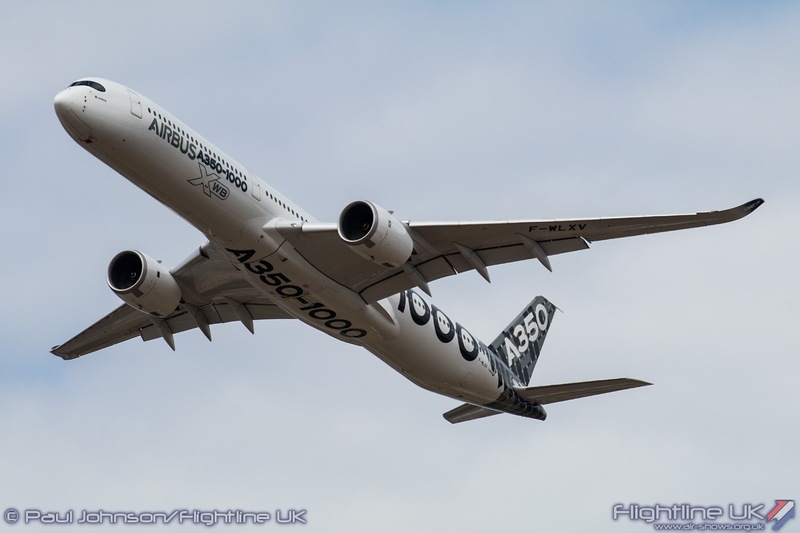 The opening day alone saw orders placed for 311 civil aircraft across the show worth $43.6bn. 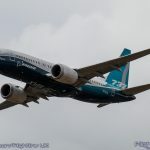 By the end of the week $192 Billion of business had been done. 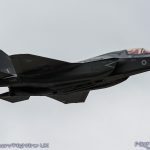 However, despite its global reach, it is still a very important event for the UK, particularly ahead of the country’s withdrawal from the European Union. 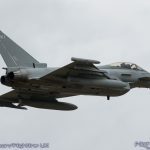 The importance of the event to the UK was underlined on the opening day when the Defence Secretary Gavin Williamson announced the publication of the UK’s new Combat Air Strategy. 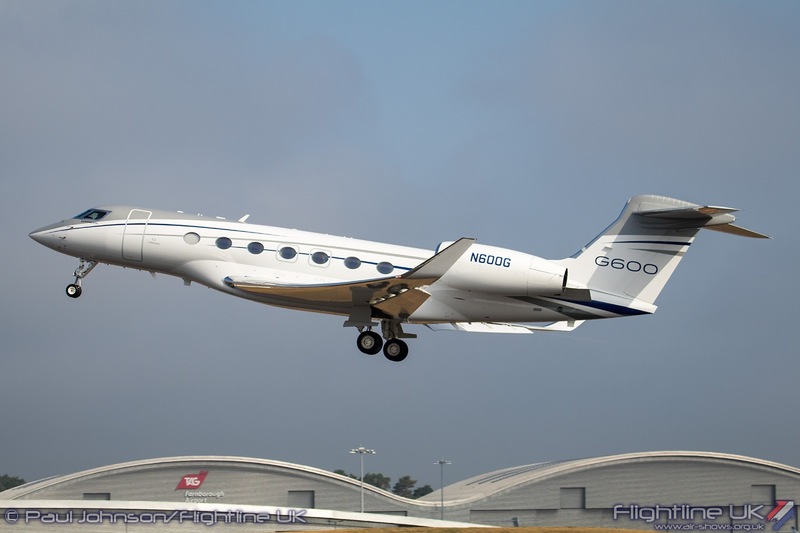 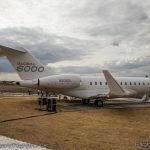 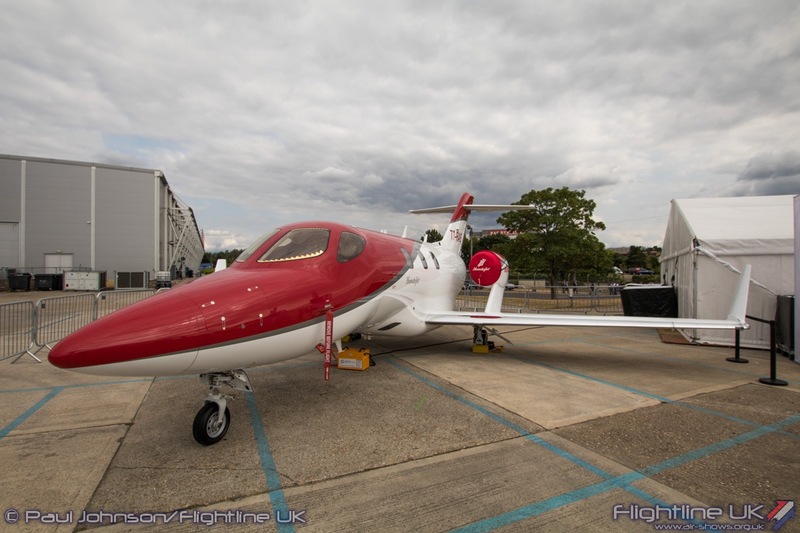 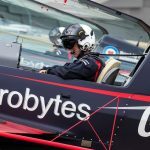 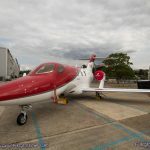 As part of this strategy a concept aircraft was unveiled which has been put together by British firms which include BAE Systems, Leonardo, MDNA and Rolls Royce. 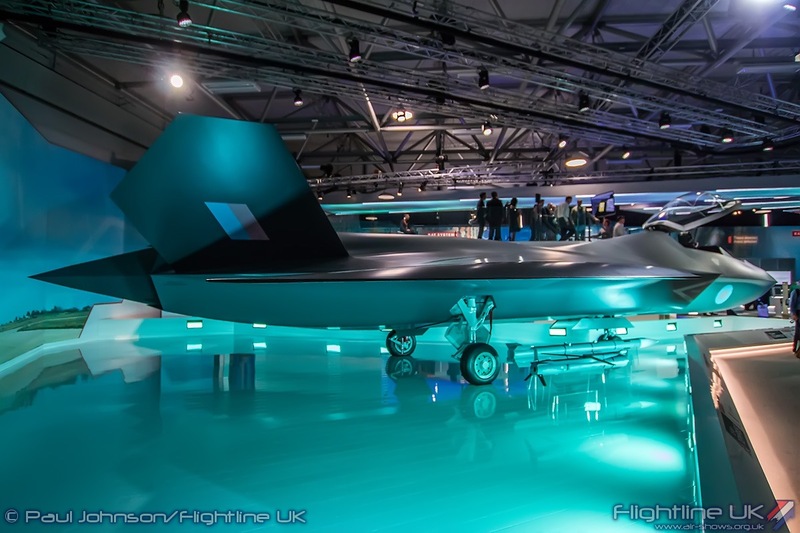 Together with the RAF’s Rapid Capabilities Office, this group of companies form “Team Tempest” to pursue options for the next generation of RAF combat aircraft. 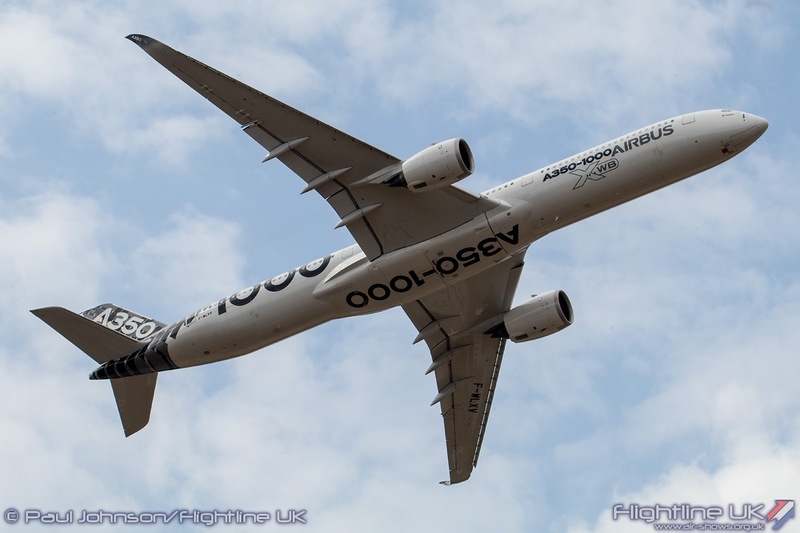 The opening day also saw exciting new for the UK’s space sector as Prime Minister Teresa May was joined by astronaut Tim Peake who was at the airshow’s Space Zone following the announcement of a vertical launch spaceport in Sutherland, Scotland. 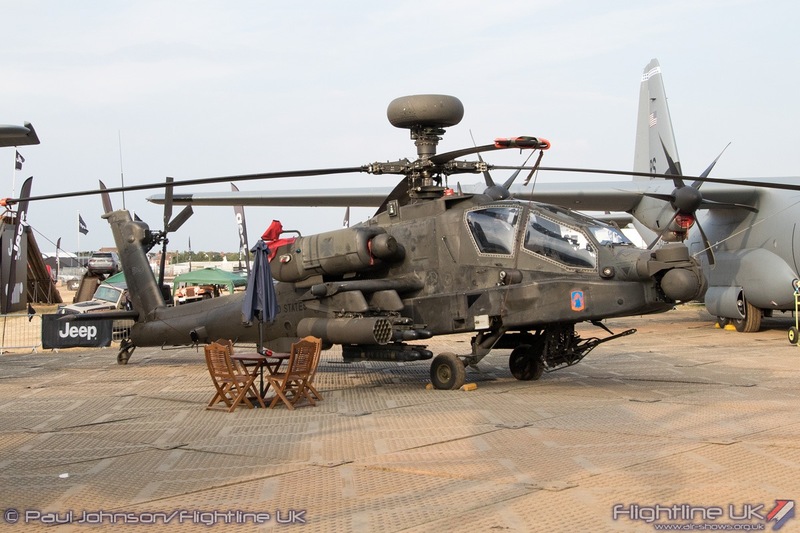 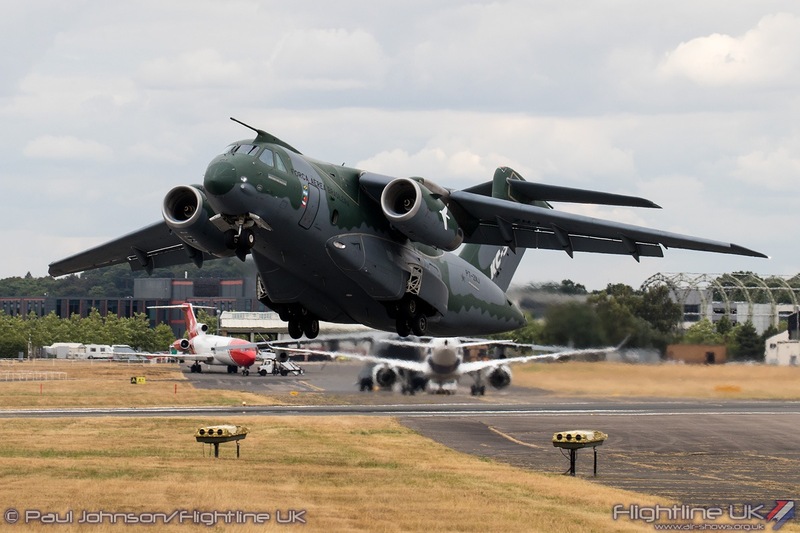 Aircraft wise, the military presence at Farnborough was slightly reduced from previous years. 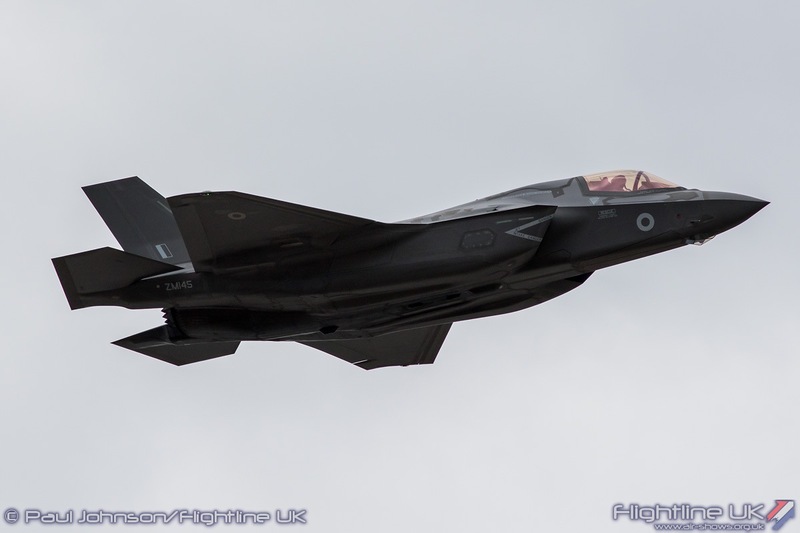 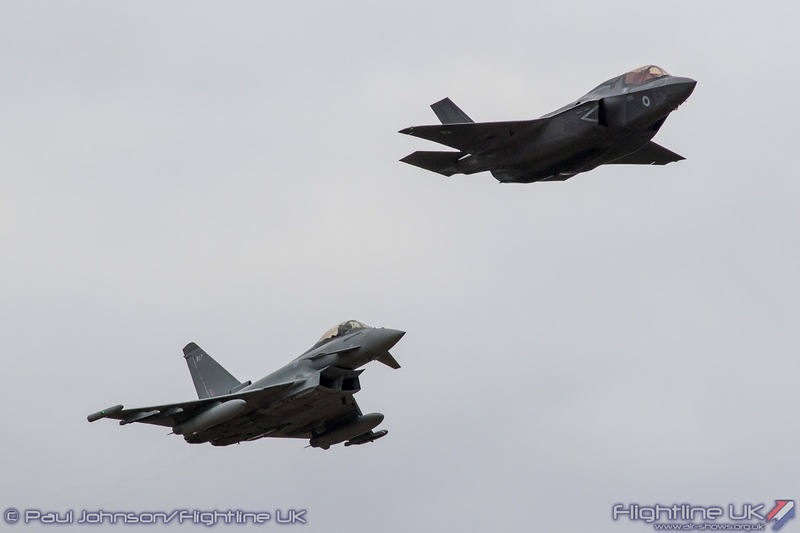 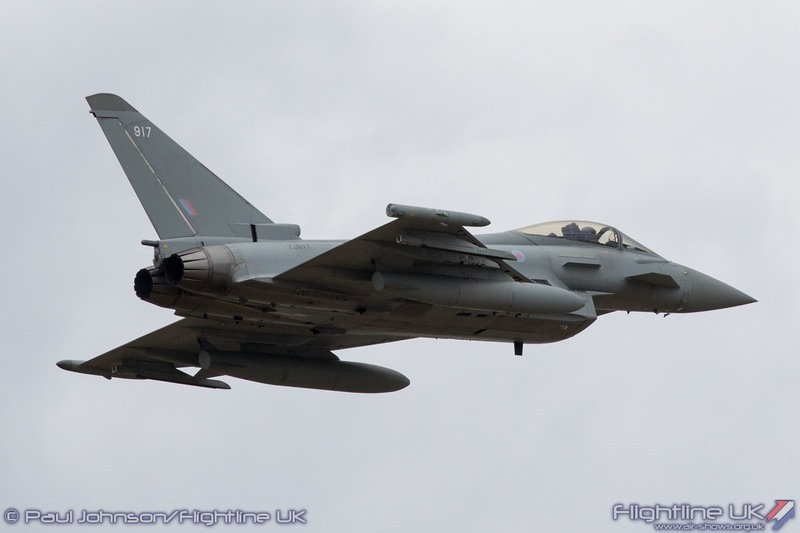 The only RAF participation in the flying displays was the opening flypasts on the Monday which featured the Red Arrows flying with a Battle of Britain Memorial Flight Supermarine Spitfire XIX followed by a Lockheed Martin F-35B Lightning an Eurofighter Typhoon FGR4. 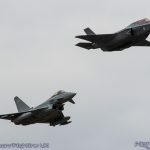 The F-35B and Typhoon formation was repeated on the Tuesday but did not appear again. 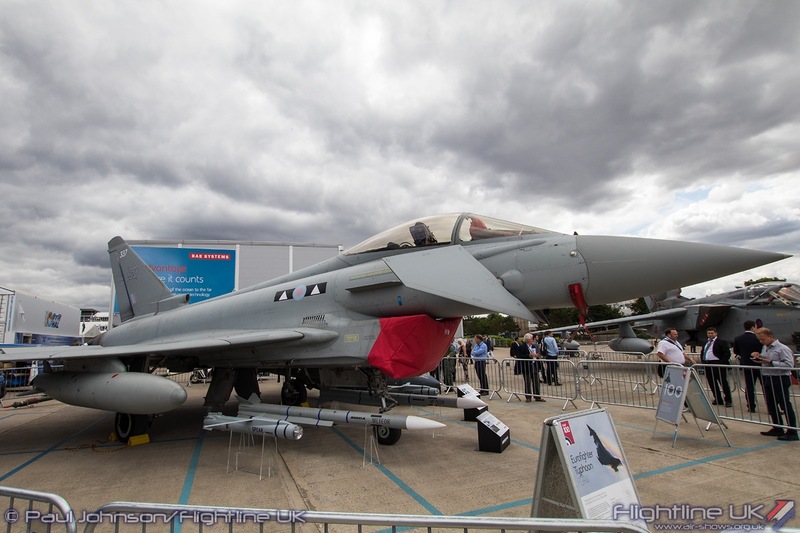 On the ground, BAE Systems hosted a static display of Eurofighter Typhoon FGR4 alongside a Panavia Tornado GR4. 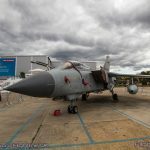 The Typhoon was displayed until Tuesday with a display of the weapons systems it can employ while the Tornado was there to mark the type’s long service with the RAF ahead of the type’s retirement early next year. 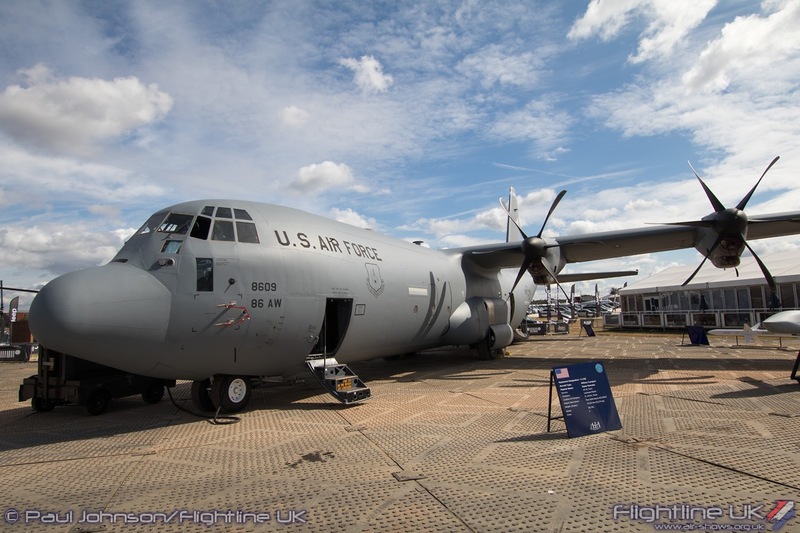 The United States Department of Defence is always a major exhibitor at Farnborough. 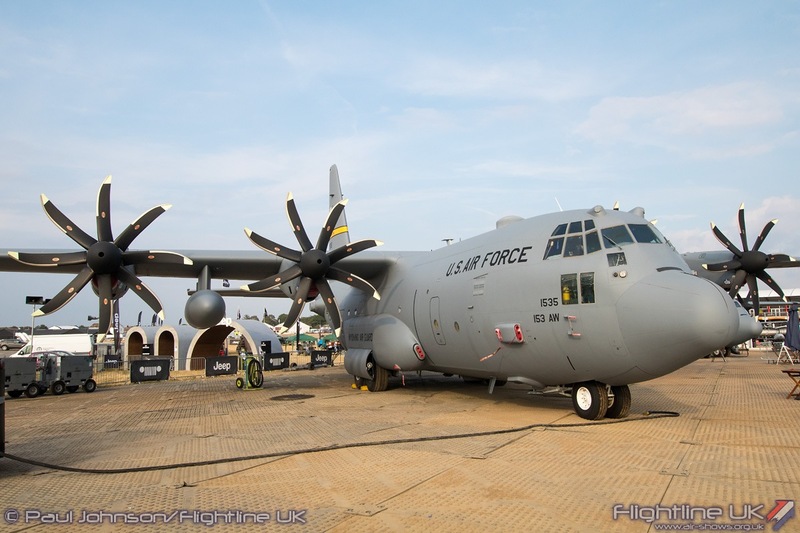 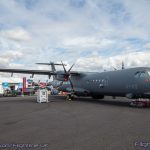 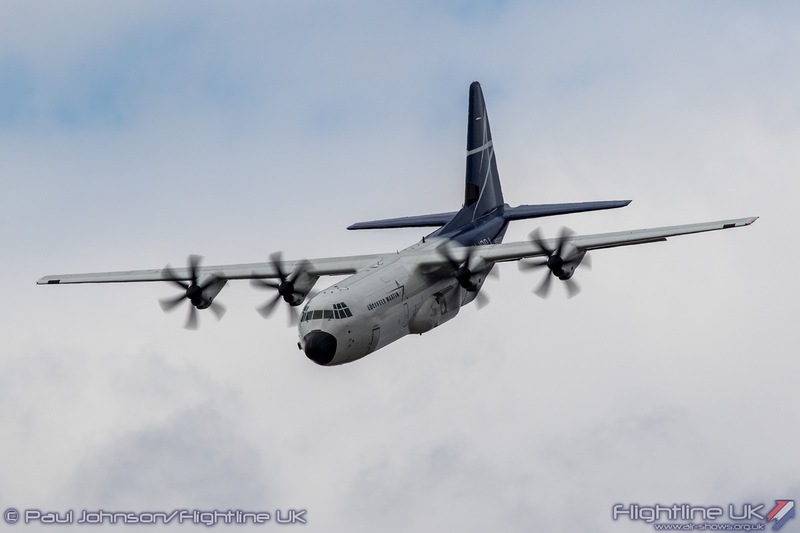 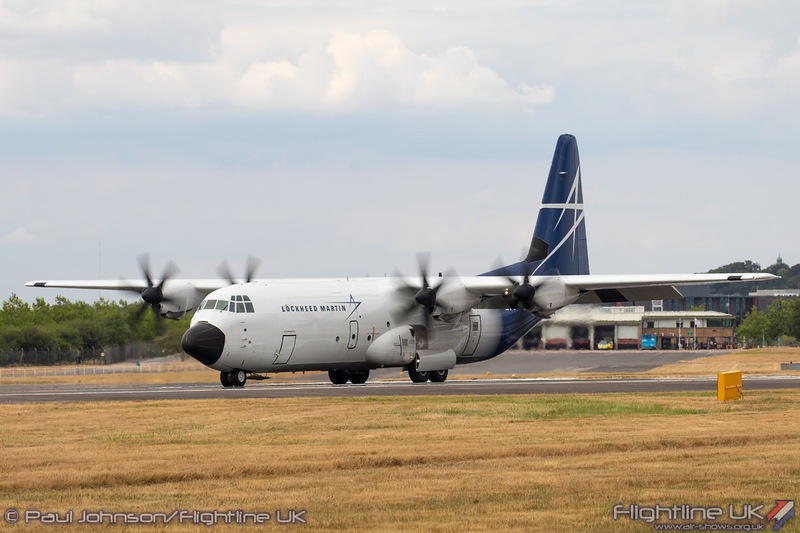 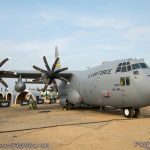 Dominating their display area this year were a pair of C-130s.The Lockheed Martin C-130J-30 Hercules II from Ramstein is a familiar sight in the UK, but it was joined by a Wyoming Air National Guard Lockheed C-130H Hercules which was fitted with new NP2000 propellers. 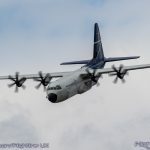 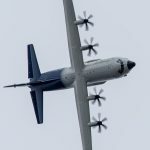 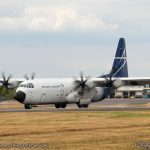 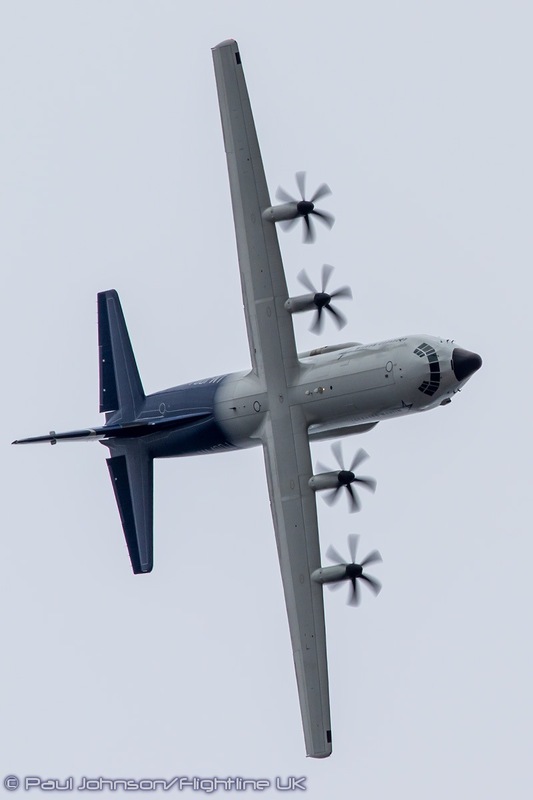 The new propellers offer several benefits to legacy C-130 users reducing noise and vibration and giving an increase in thrust. 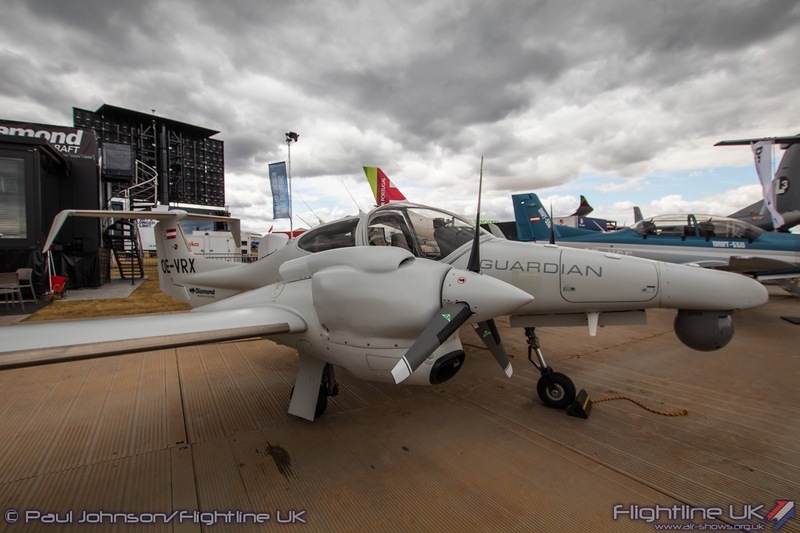 Maintenance is also made easier as the blades can be replaced without removing the whole propeller assembly. 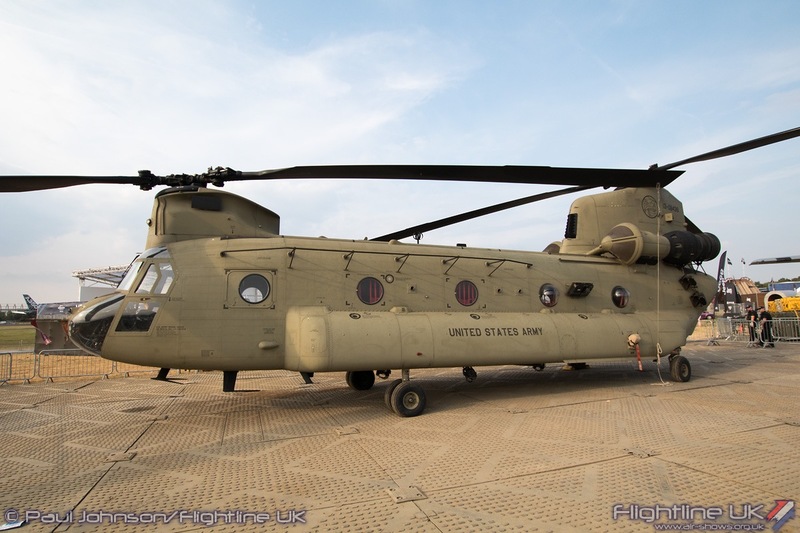 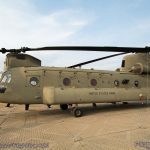 Also tucked in with the C-130s were a Boeing AH-64D Apache, Boeing CH-47F Chinook and Boeing F-15E Eagle. 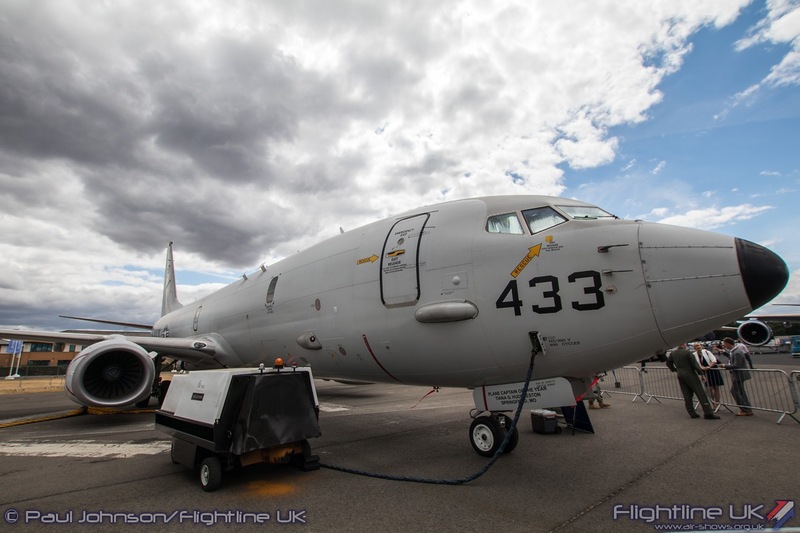 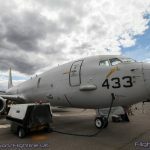 At the other end of the static display, a US Navy Boeing P-8A Poseidon was also present for the opening days of the show. 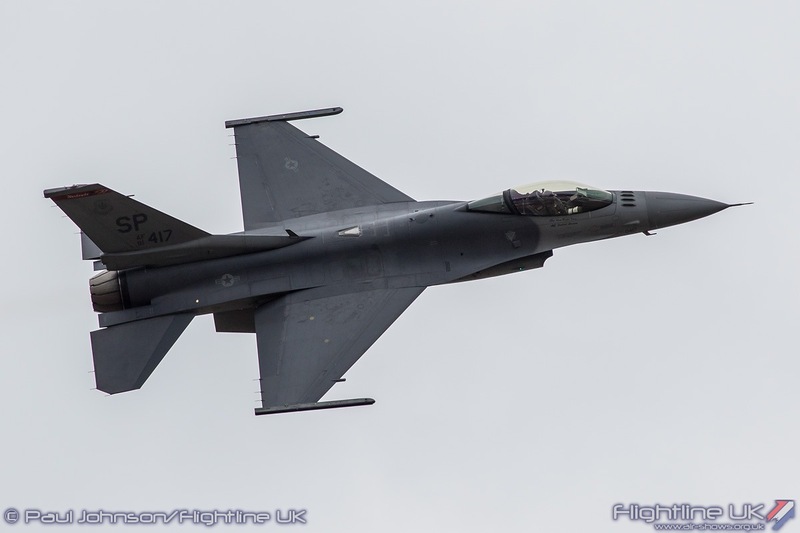 In the air, the Department of Defence was solely represented by a Lockheed Martin F-16C Fighting Falcon. 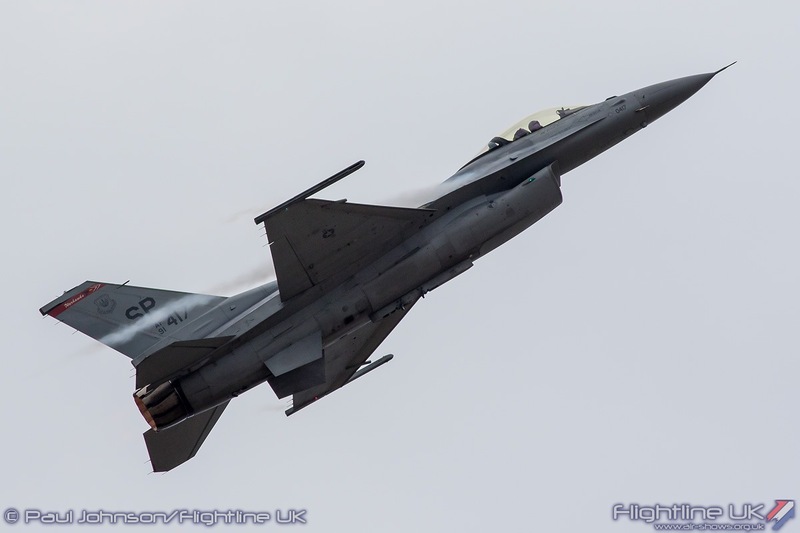 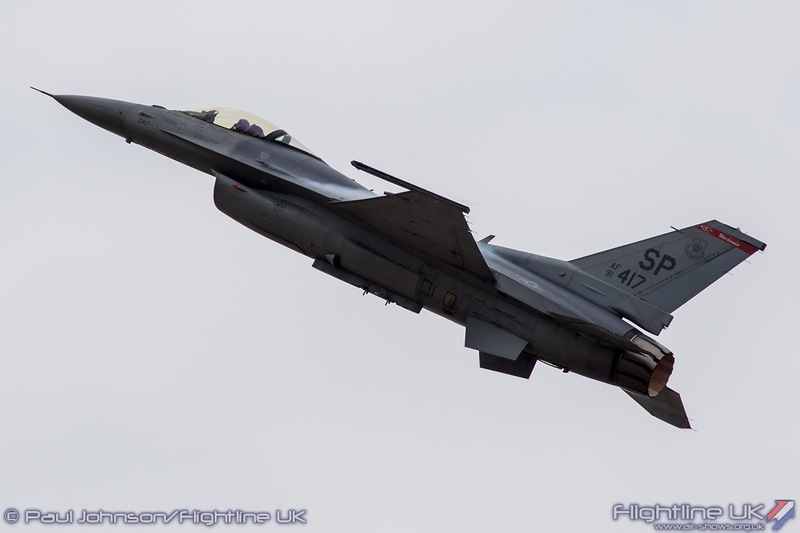 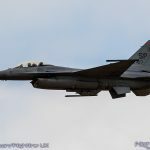 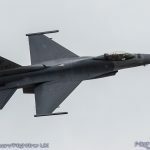 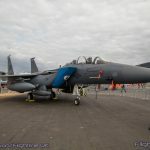 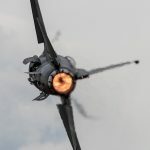 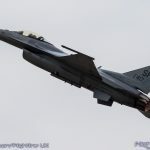 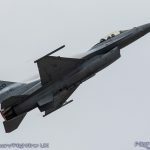 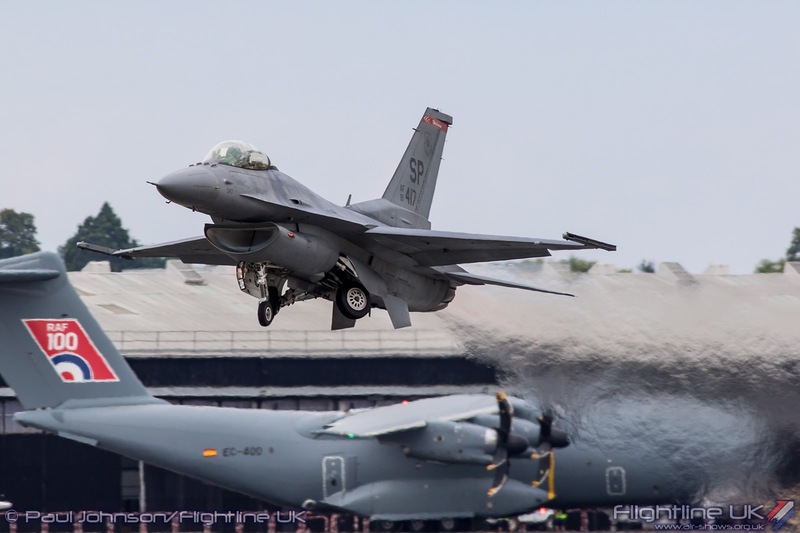 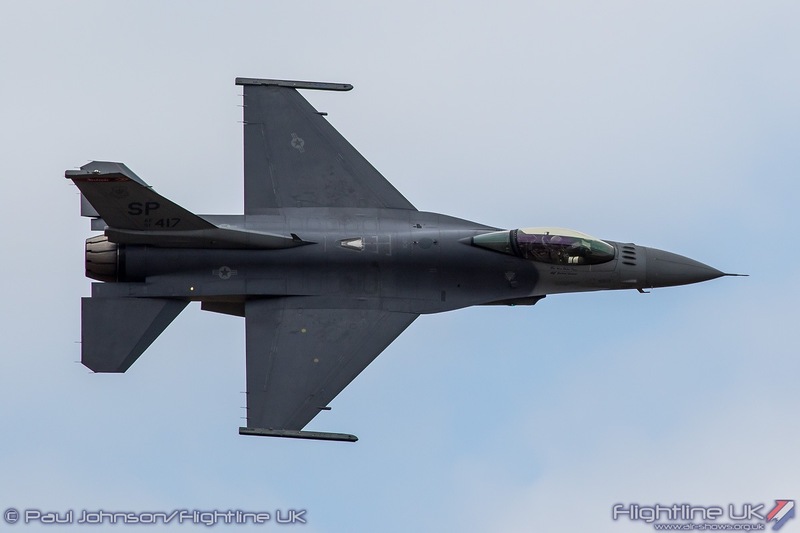 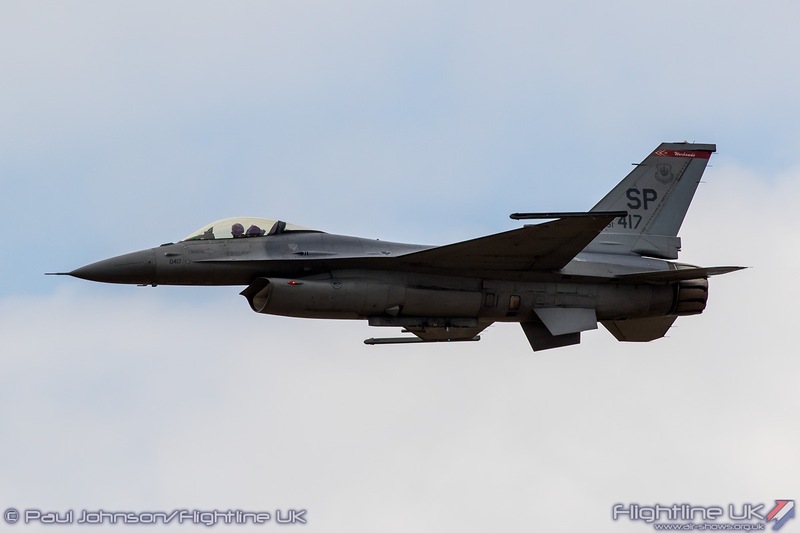 The aircraft came from USAFE’s 52nd Fighter Wing based at Spangdalem in Germany but it was crewed by the Pacific Air Forces Demonstration Team which is based at Misawa Air Base, Japan. 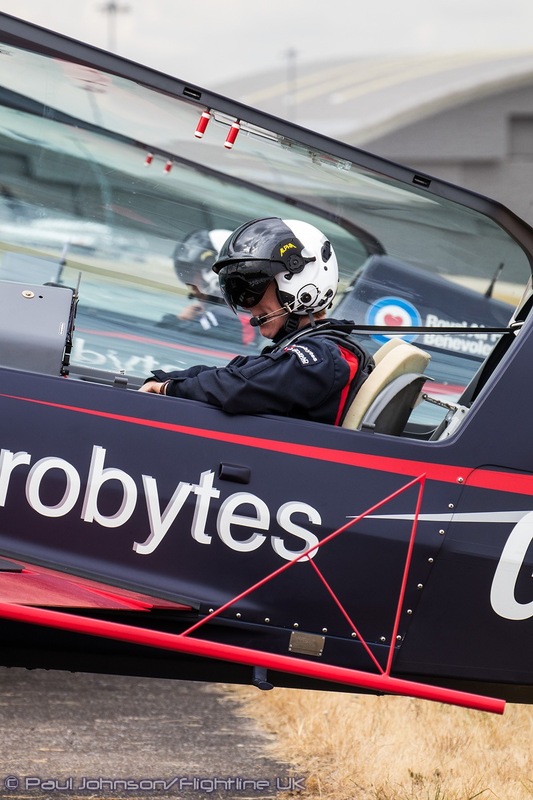 It proved to be a challenging week for the team led by pilot Jacob “Primo” Impellizzeri. 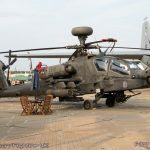 as they contented with some maintenance issues with their allotted aircraft. 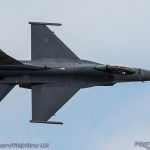 However, as the only fast jet demo in the trade day displays, they added some much needed noise and spectacle to the days they flew. 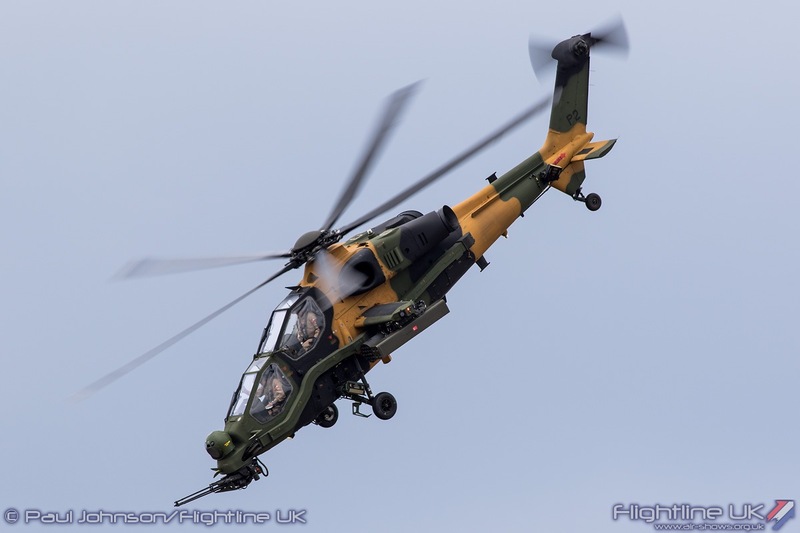 Turkish Aerospace Industries has a significant presence in the static display. 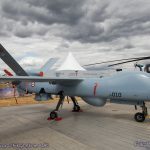 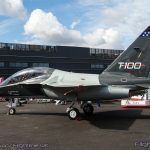 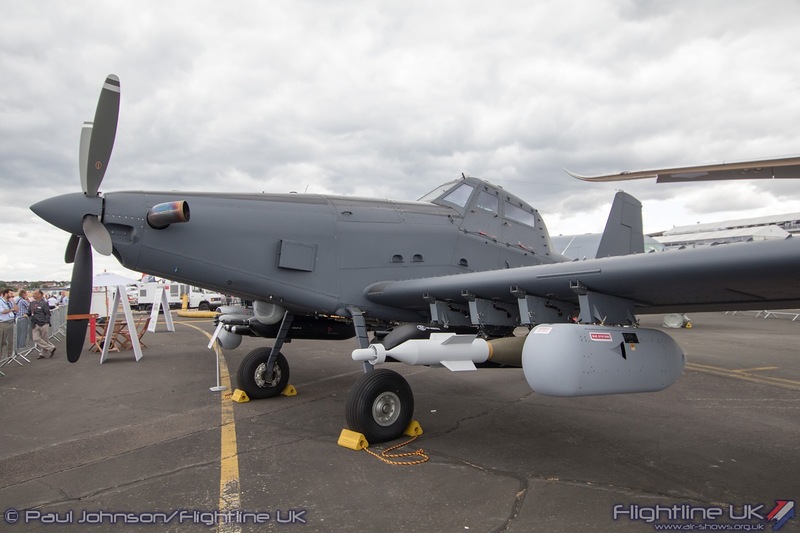 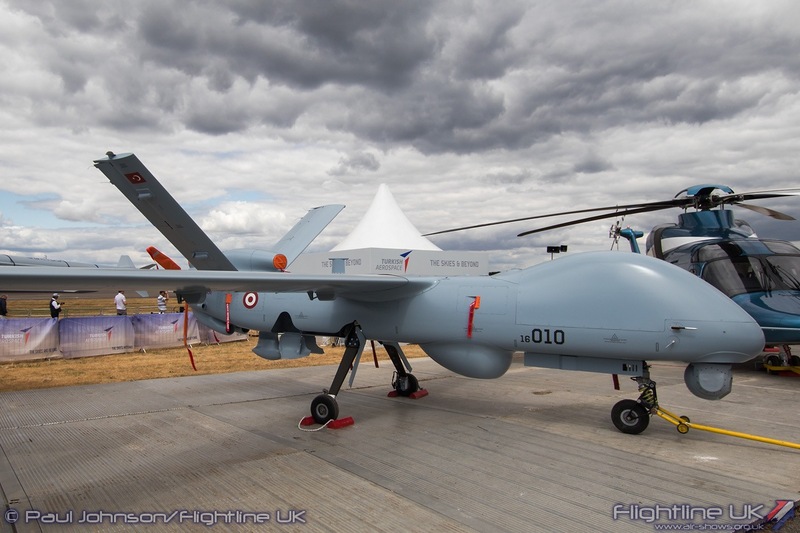 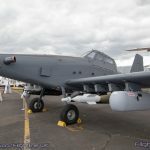 It has two full scale replicas of its proposed Hurjet advanced jet trainer and the TAI 625 helicopter on show alongside the ANKA Remotely Piloted Air System (RPAS). 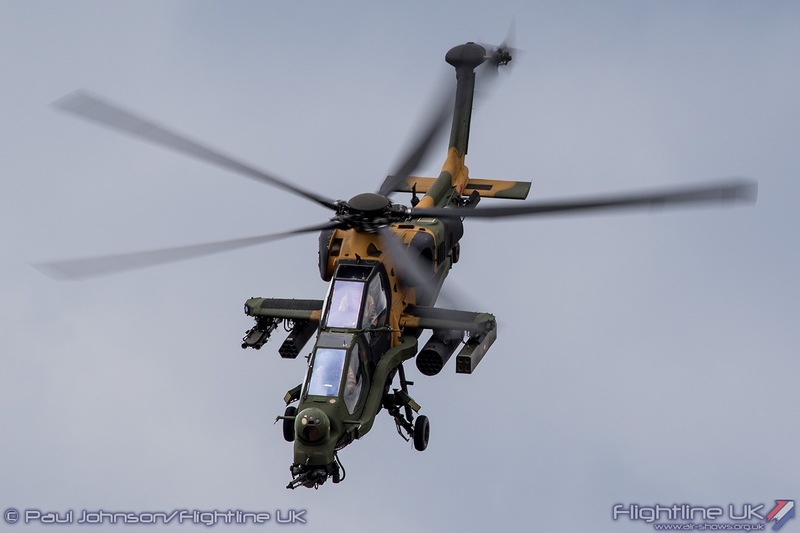 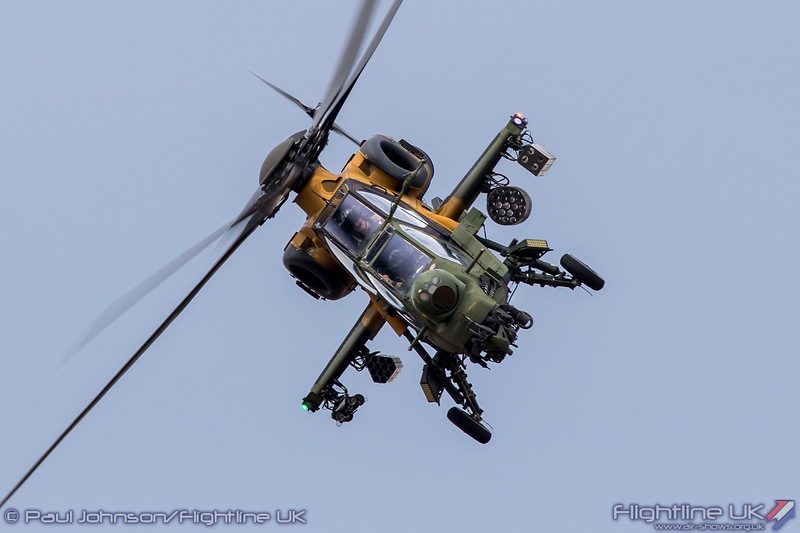 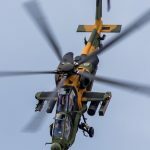 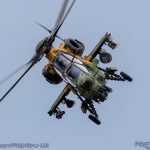 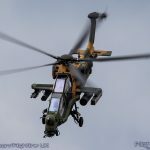 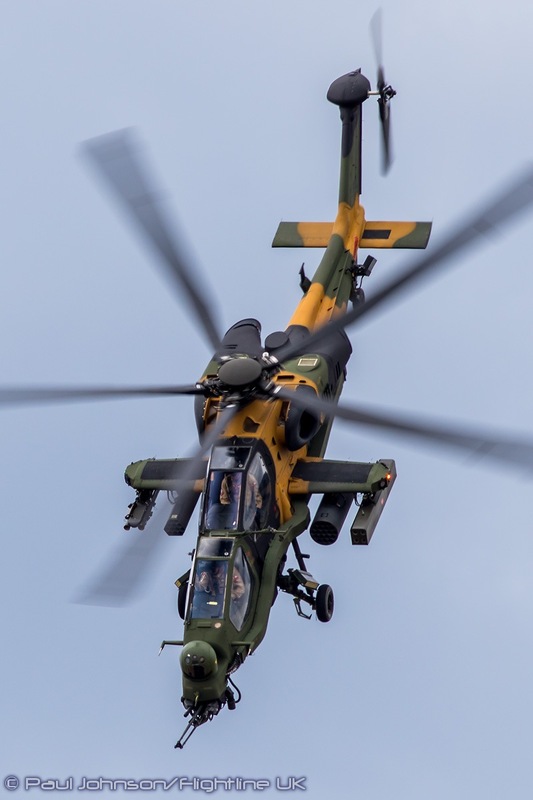 In the air, TAI displayed the T-129 ATAK battlefield helicopter. 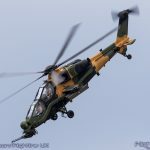 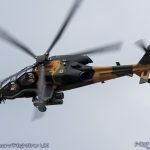 This is a significant development of the Agusta A129 Mangusta attack helicopter. 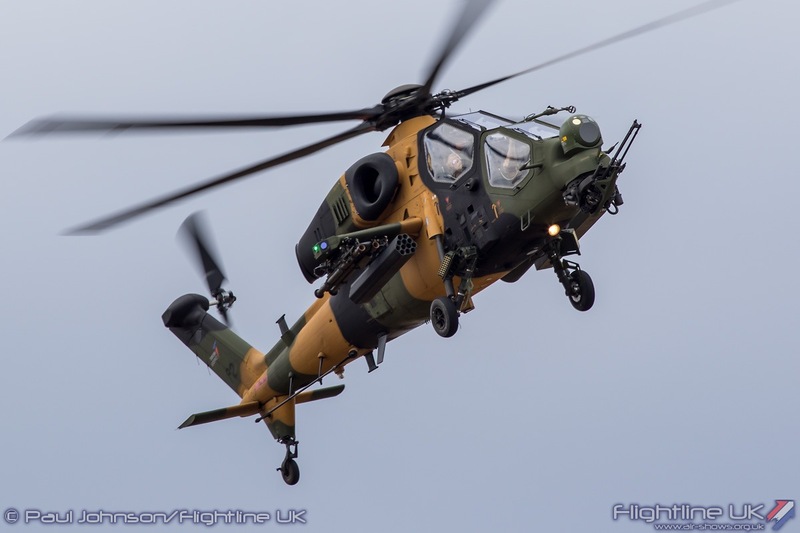 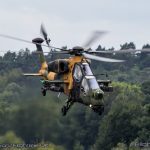 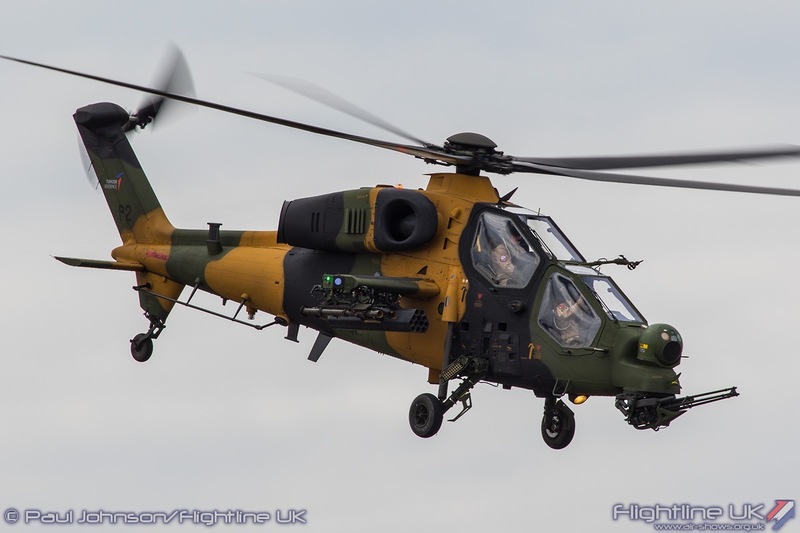 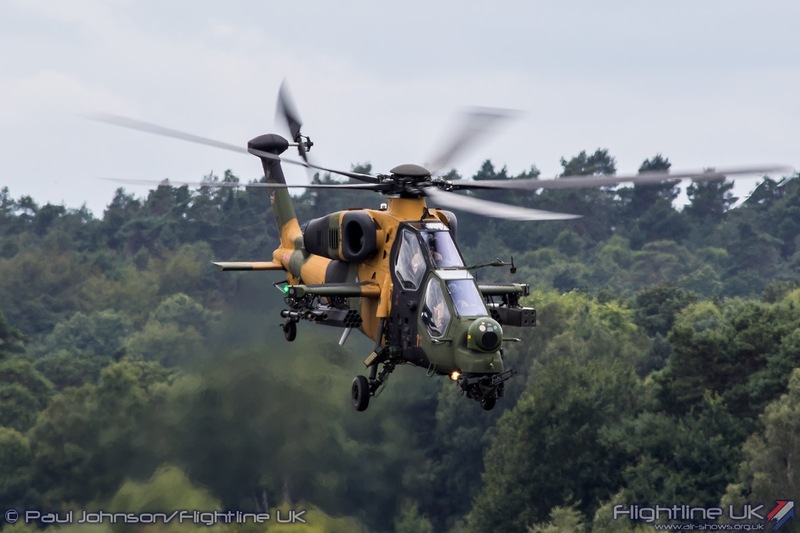 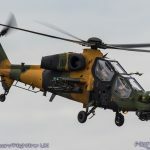 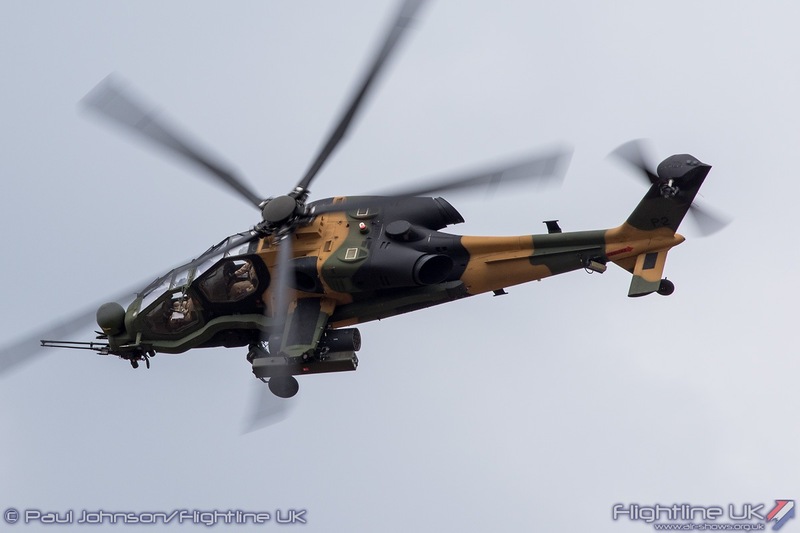 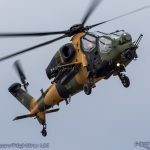 Together with Leonardo, TAI has developed the design into a modern attack helicopter for the Turkish Land Forces and is keen to market the helicopter to international customers following an order from Pakistan for 30 helicopters. 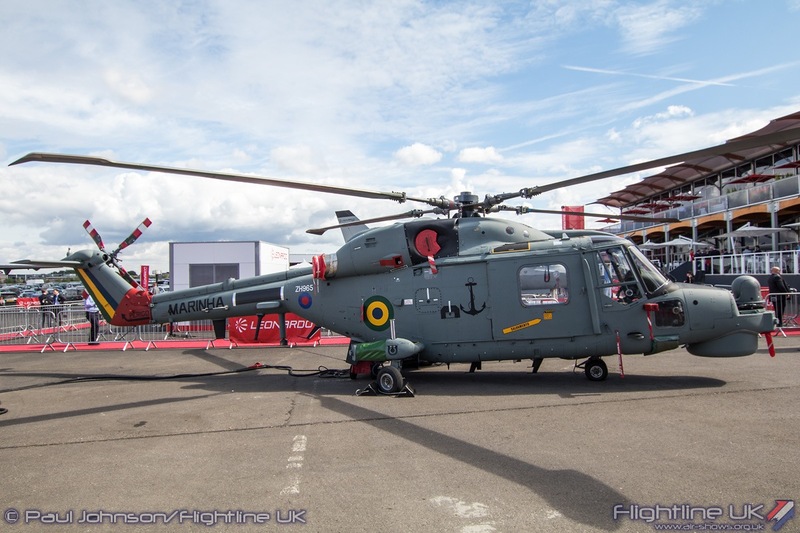 Leonardo’s impressive exhibition space opposite the new Hall 1 contained a few military gems including the public debut of the Royal Norwegian Air Force’s Leonardo AW101 Merlin Search and Rescue helicopter, a AW159 Wildcat HMA2, Brazilian Navy Super Lynx 300, M-346 Master, T-100 demonstrator and an Italian Air Force P-72A Maritime Patrol Aircraft. 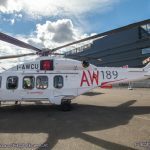 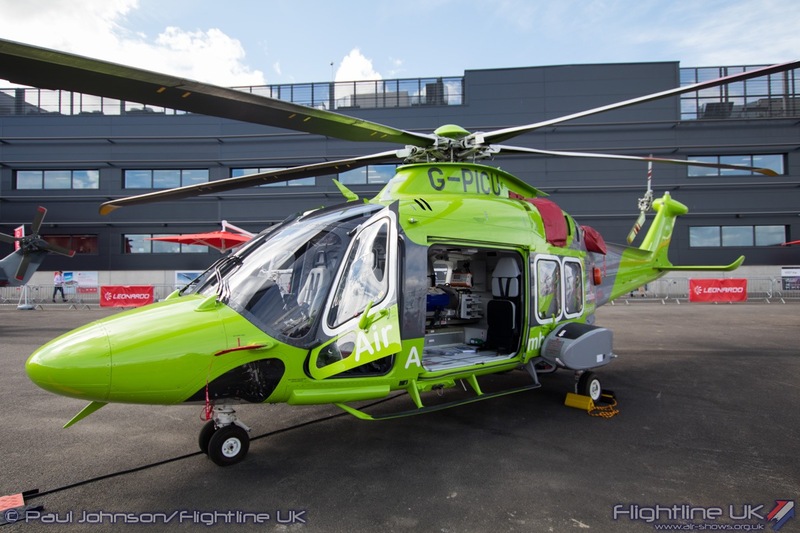 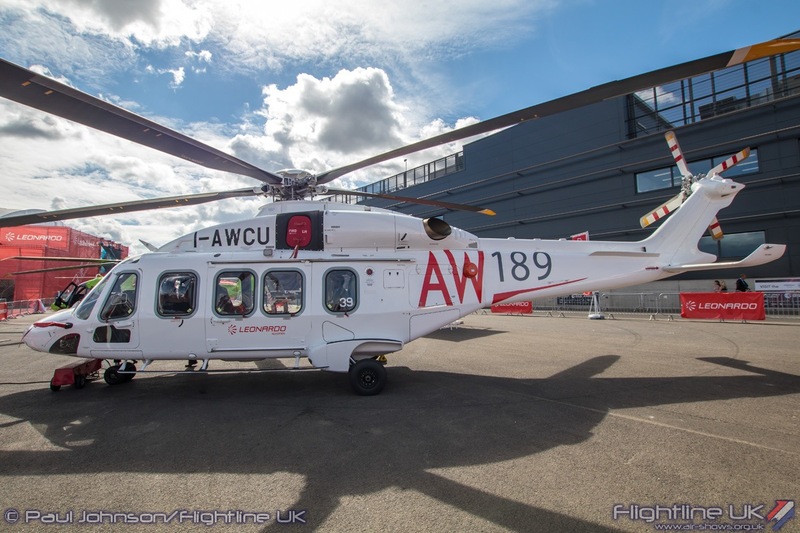 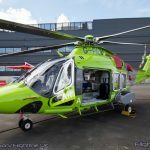 Leonardo also displayed some of the civilian helicopters including the AW189 and an Air Ambulance configured AW169. 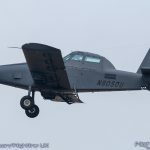 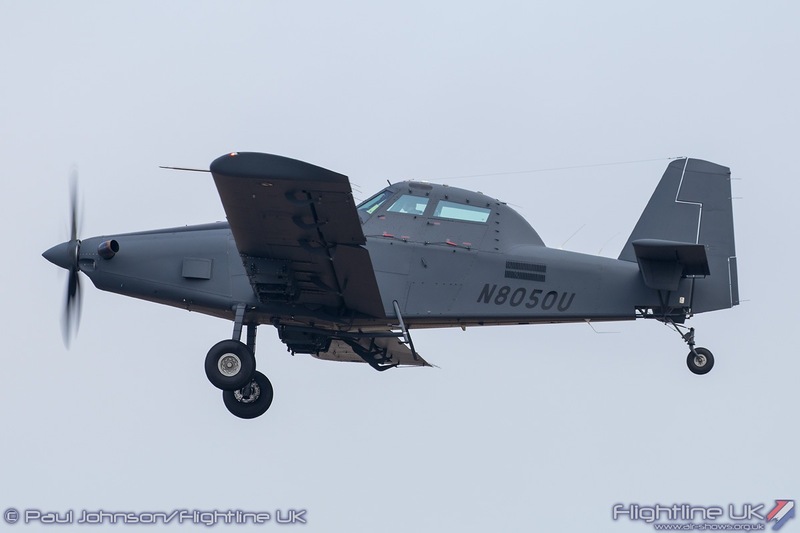 Tucked away at the top of the hill near the Aviator hotel were the Textron group of companies with a wide range of aircraft including the T-6 Texan and a number of helicopters. 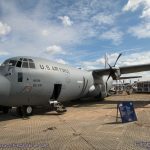 Military and civilian airlift and cargo was a strong theme running through the show. 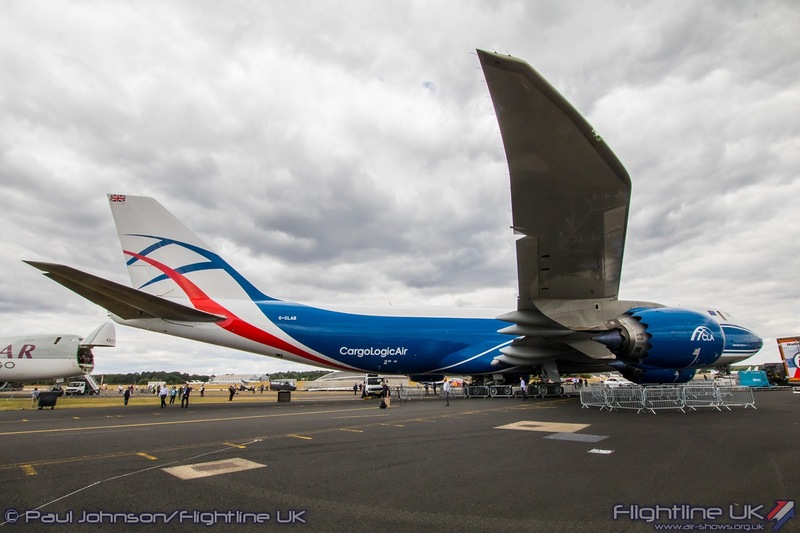 The Cargo Village has become an important part of the trade week hosting its own conferences and presentation. 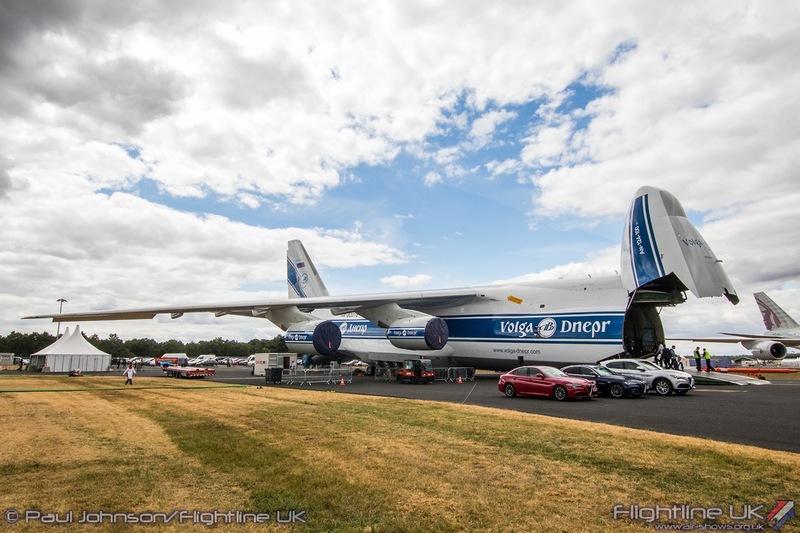 Volga-Depnr once again had examples of the Antonov An-124 Ruslan and Boeing 747-8F on show. 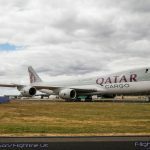 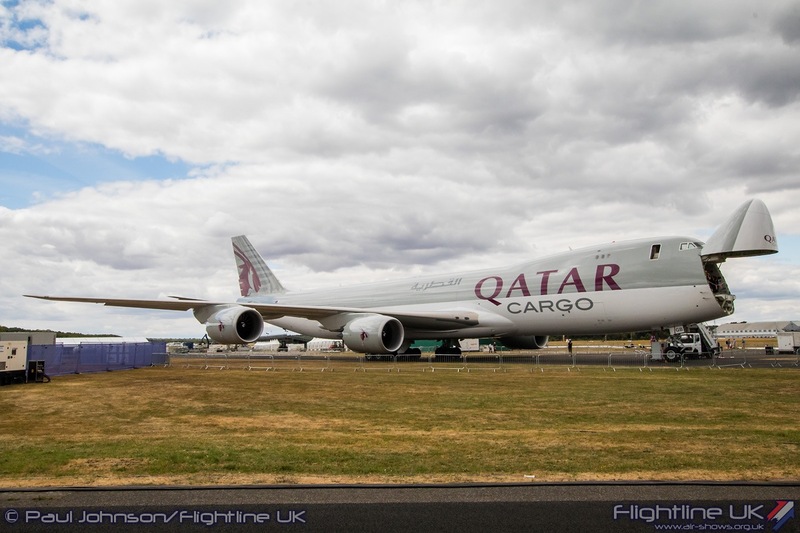 Another Boeing 747-8F was also exhibited by Qatar Airways. 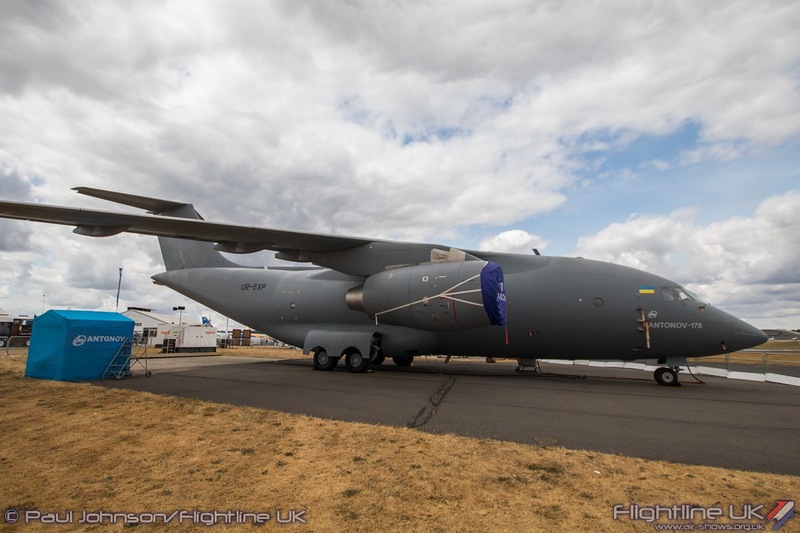 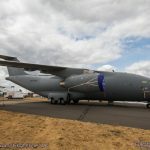 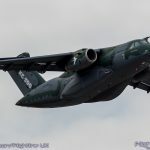 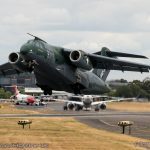 Antonov also returned to Farnborough with the An-178 which is envisaged to have both military and civilian application. 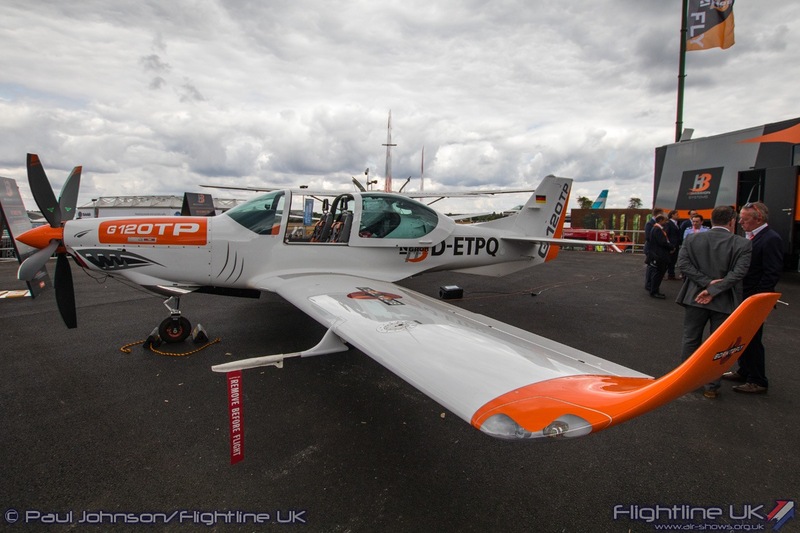 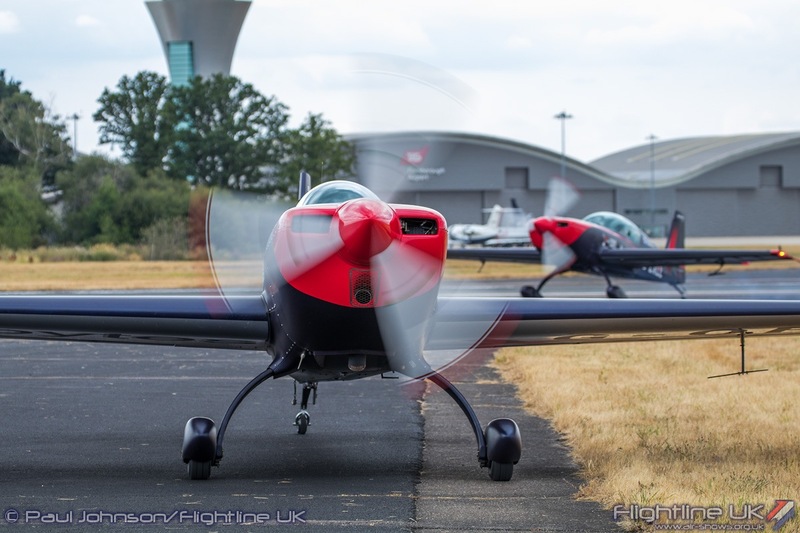 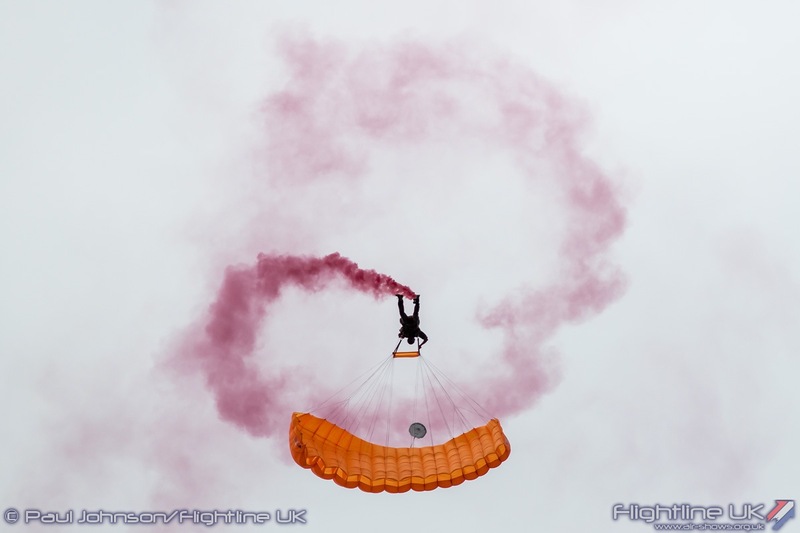 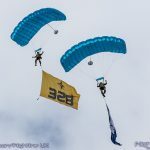 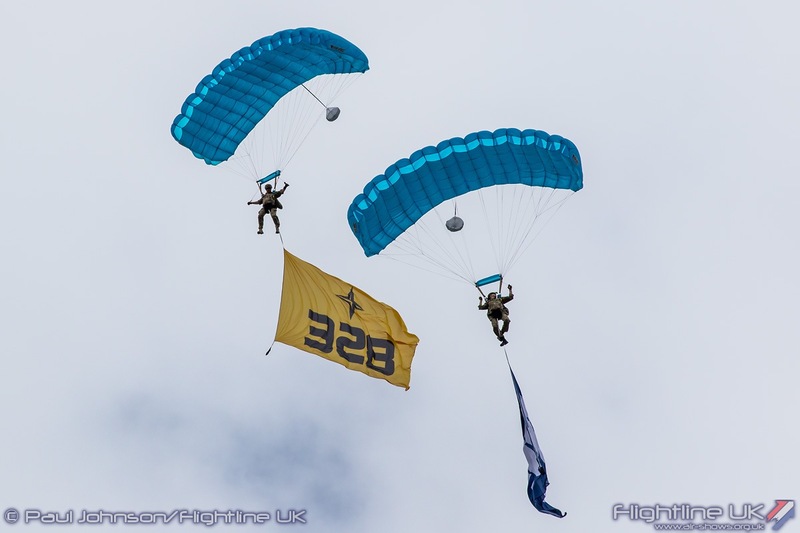 328 Support GmbH also returned to Farnborough with aircraft in the static and flying displays. 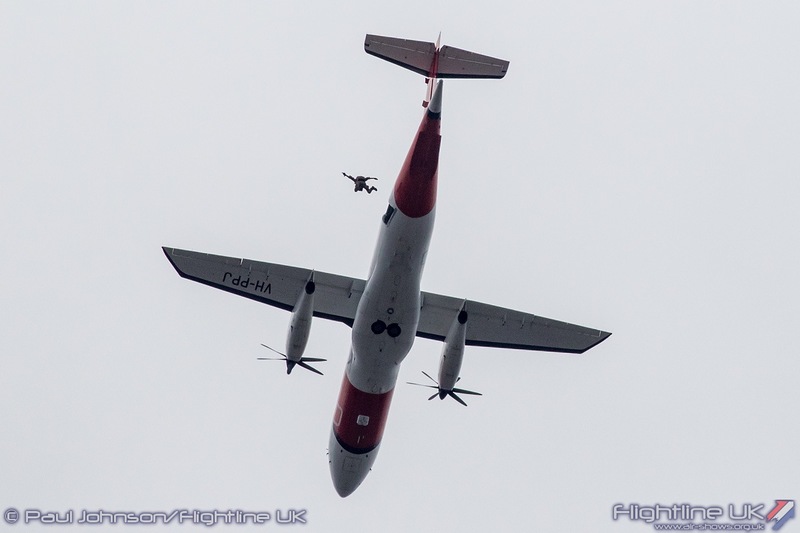 For the flying, the various capabilities of the Dornier 328 were highlighted with a parachute drop and separate solo handling display. 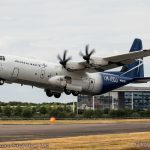 One of the most astonishing displays of trade week also involved a new civilian cargo aircraft, the Lockheed Martin LM-100J Hercules. 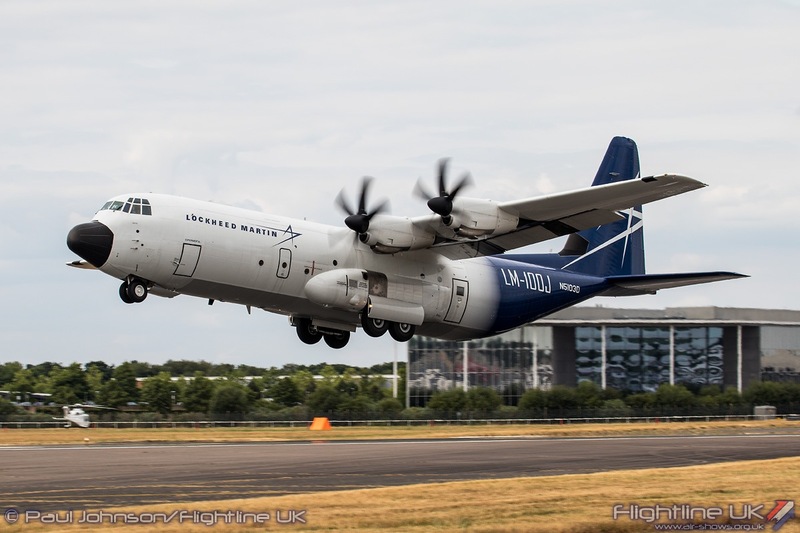 A development of the military C-130J-30, the LM-100J is the successor to the L-100 cargo aircraft. 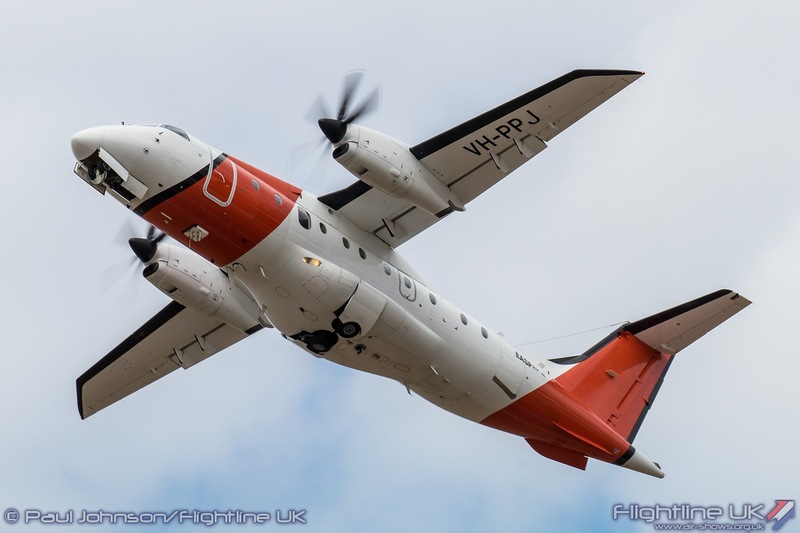 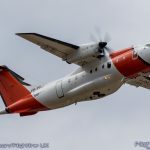 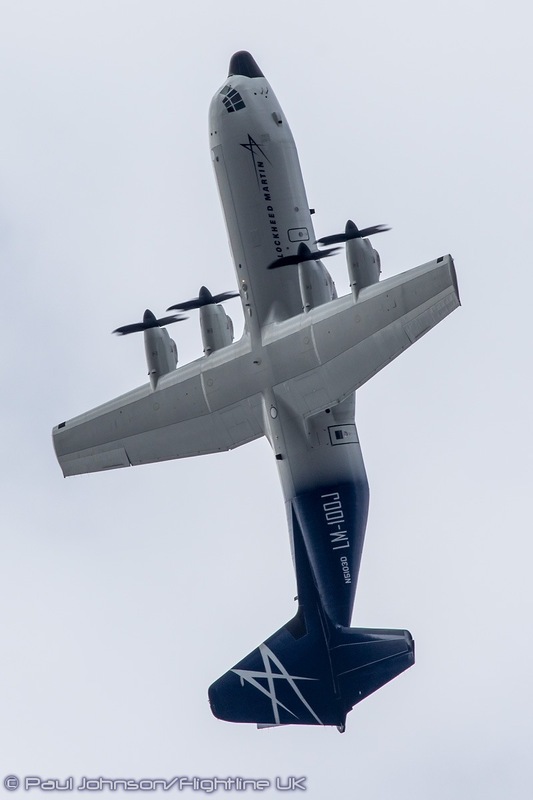 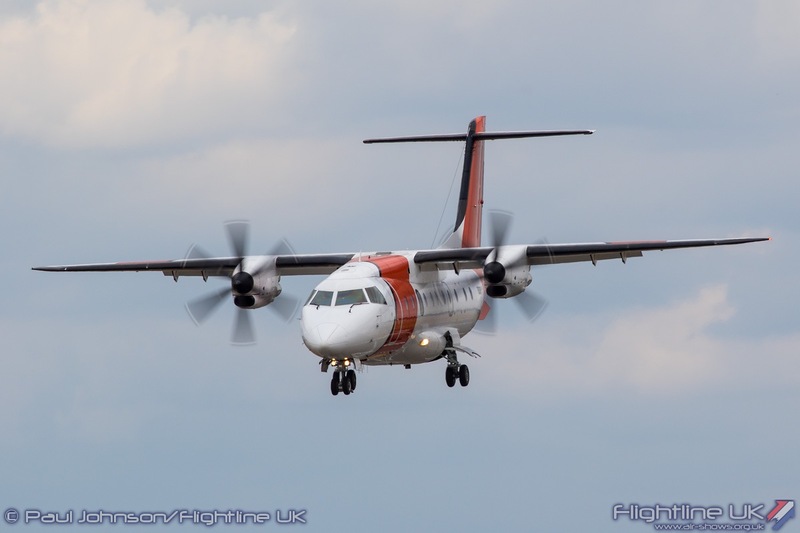 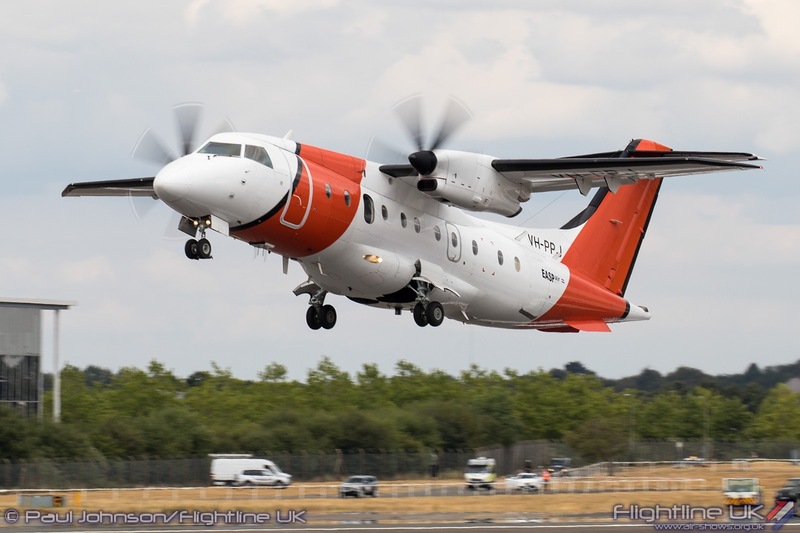 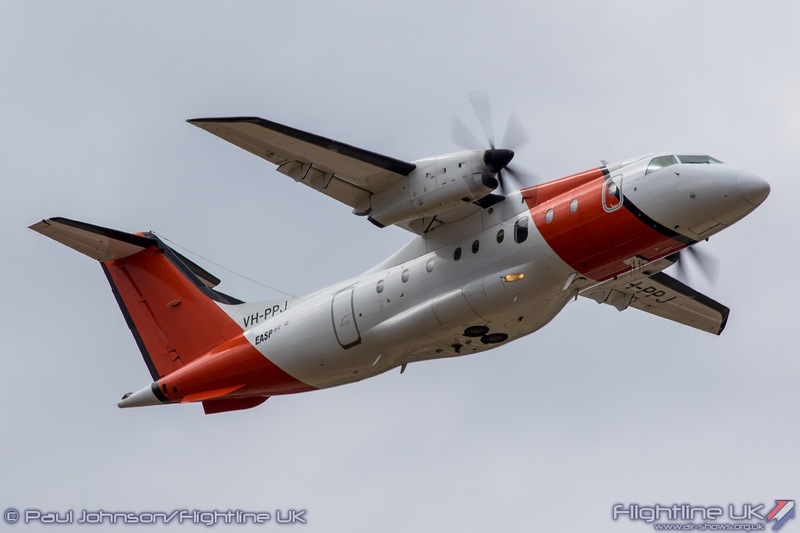 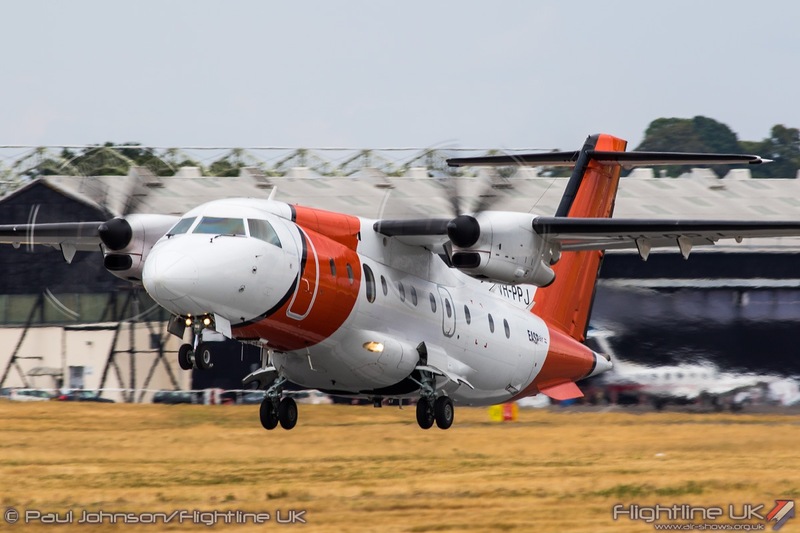 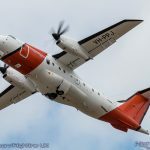 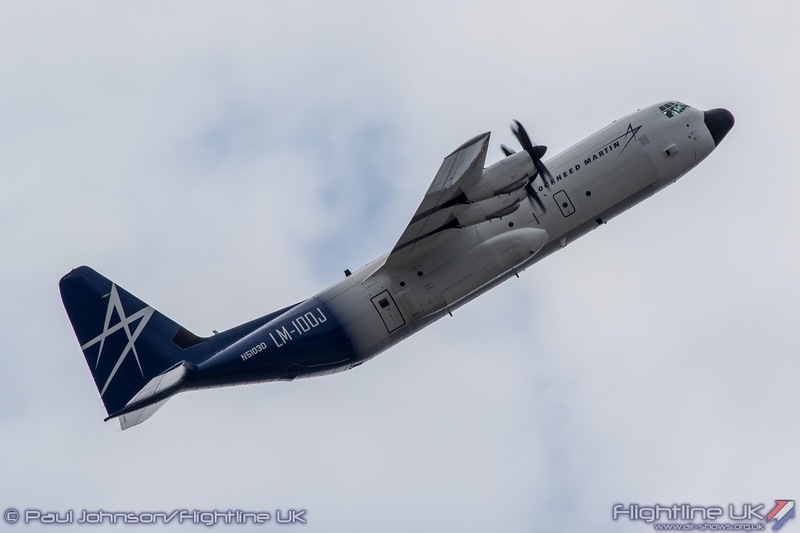 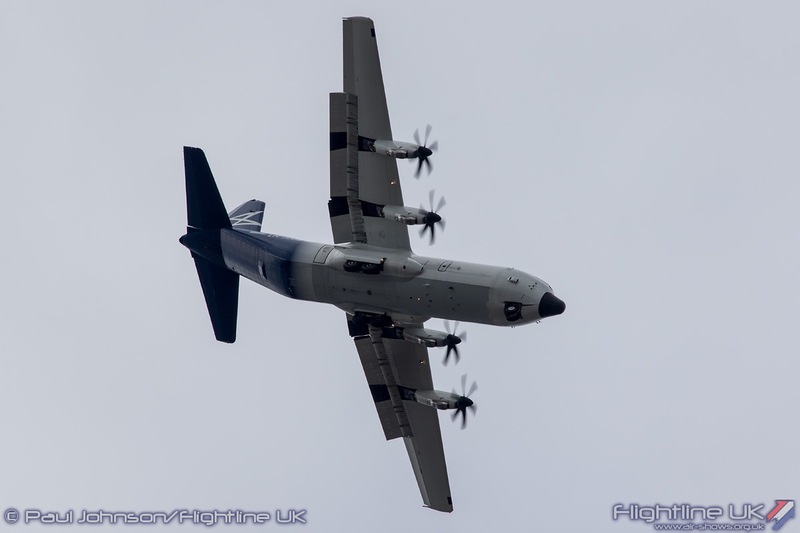 With modern construction, more powerful engines and efficient propellers, the LM-100J has a sparkling performance which was shown off to dramatic effect in the flying display by LM’s chief test pilot, Wayne Roberts. 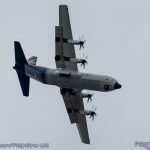 Wayne opened his display with an incredible demonstration of the power and agility of the Hercules pulling the aircraft into an oblique loop as if to avoid terrain within a valley. 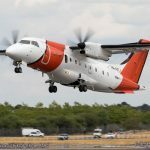 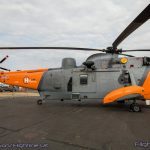 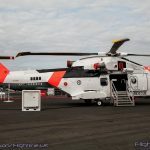 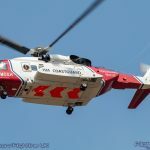 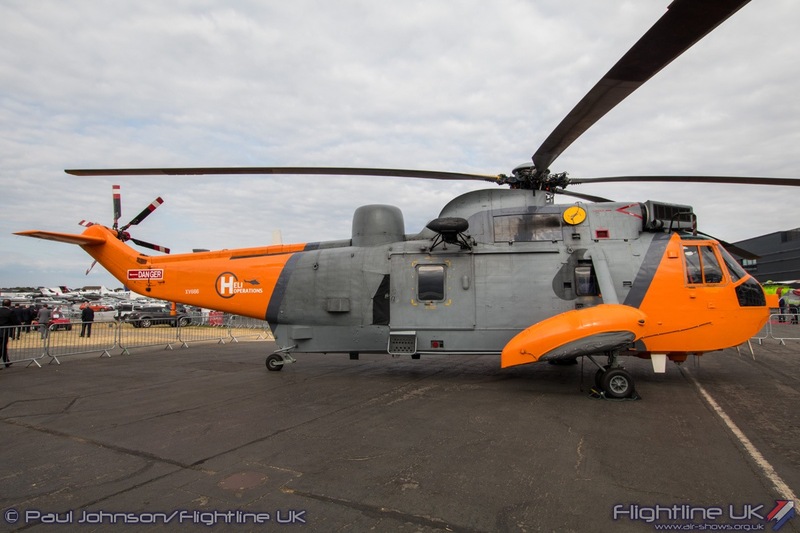 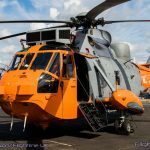 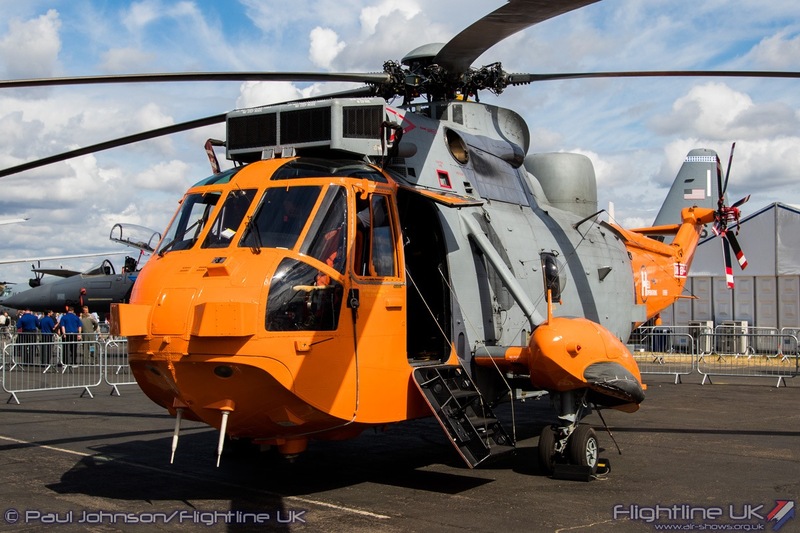 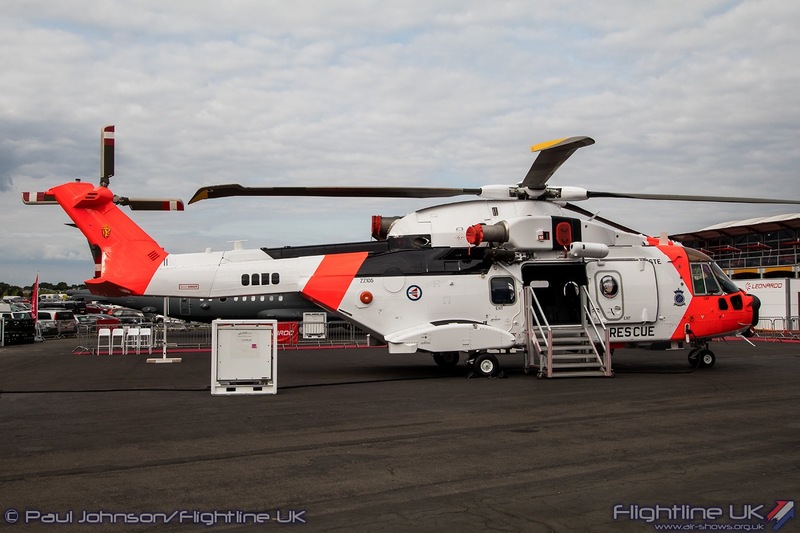 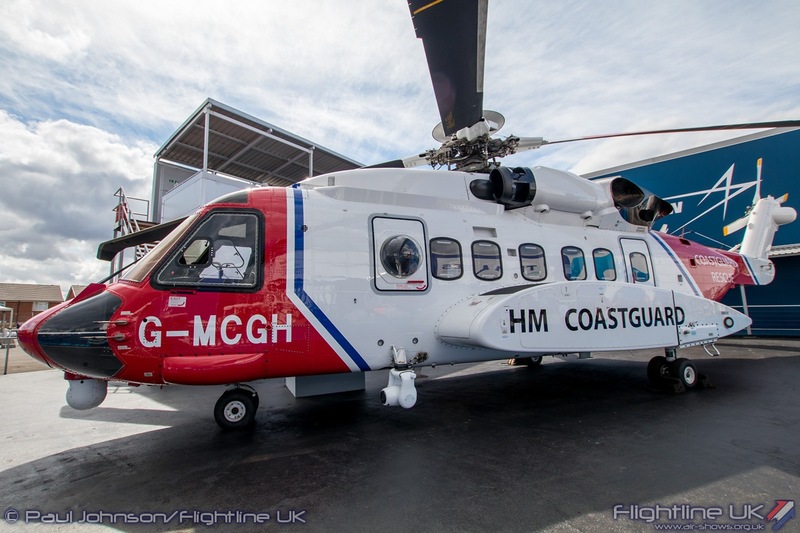 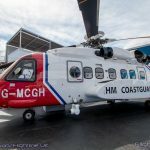 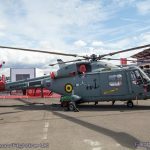 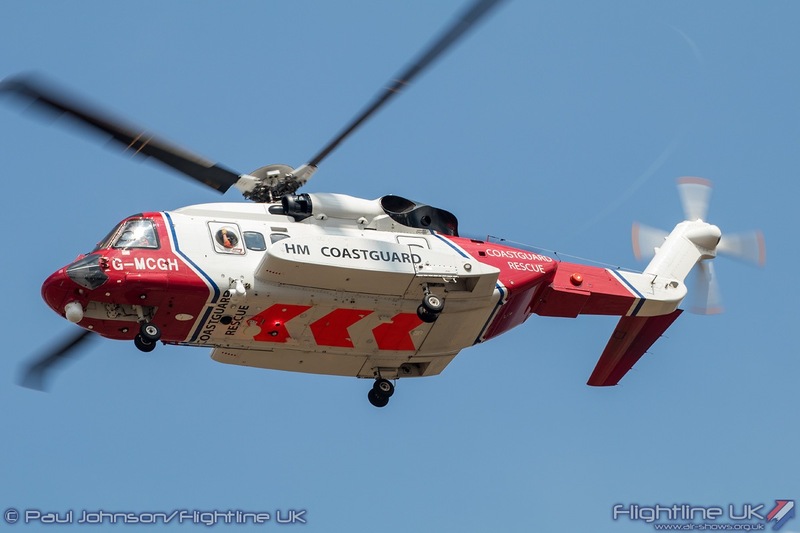 Outside their own exhibition area, Lockheed Martin showcased the Sikorsky S-92’s contribution to Search and Rescue operations with an example from the Maritime and Coastguard Agency. 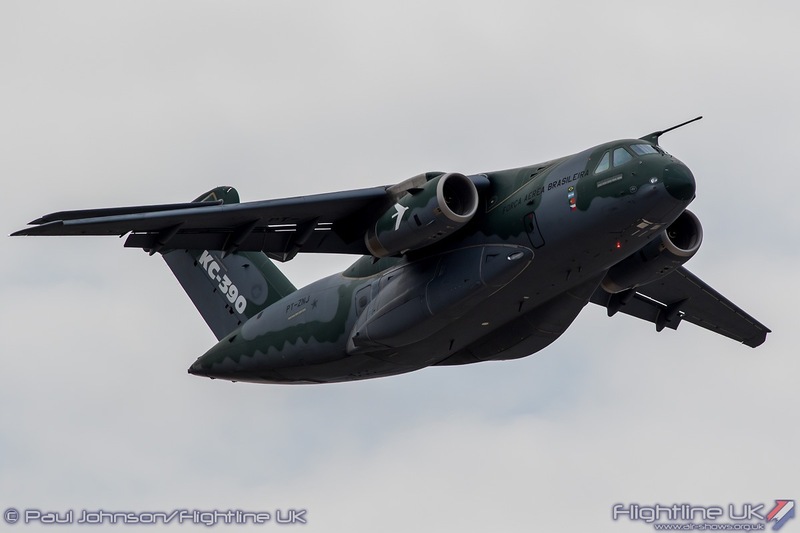 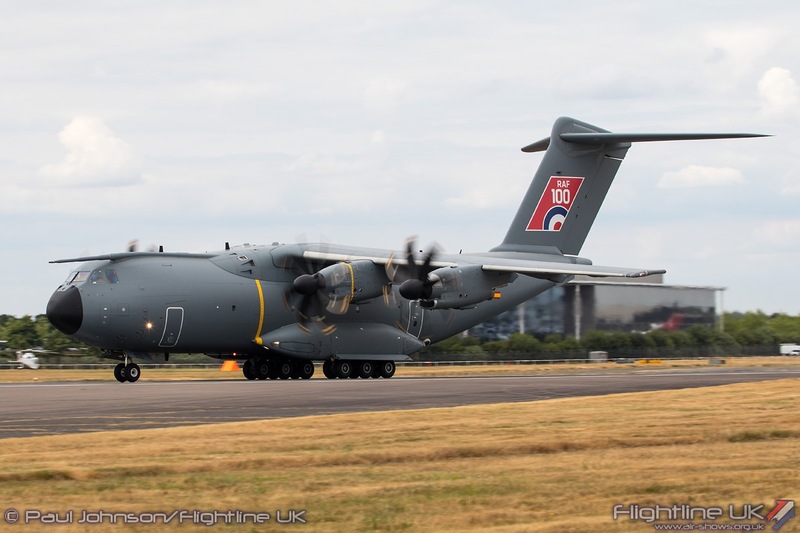 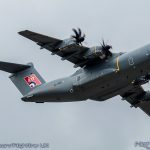 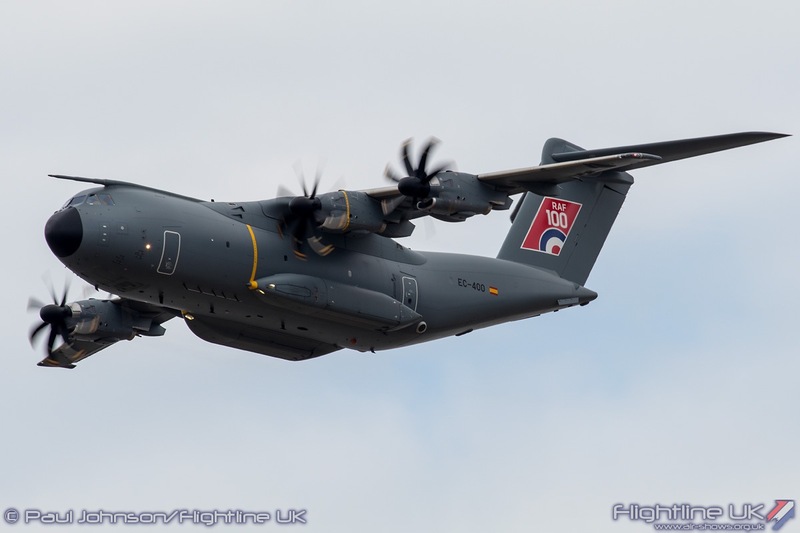 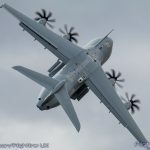 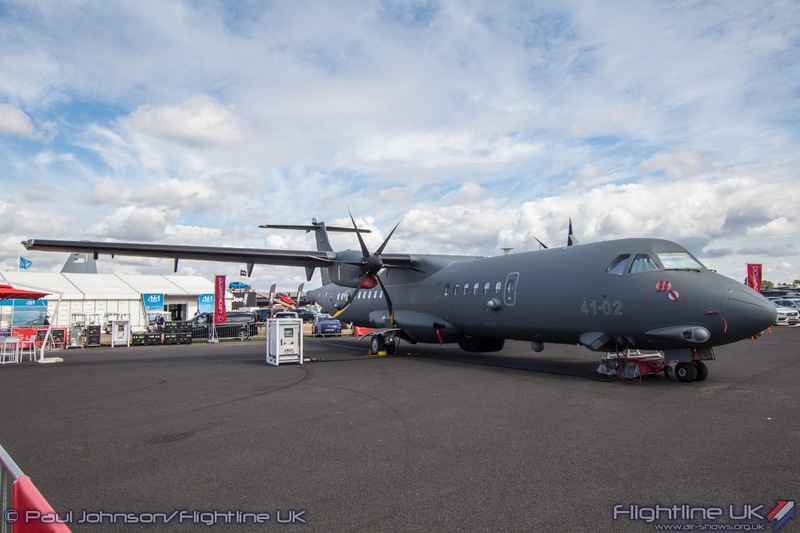 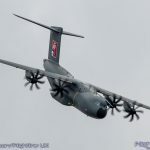 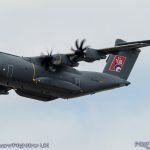 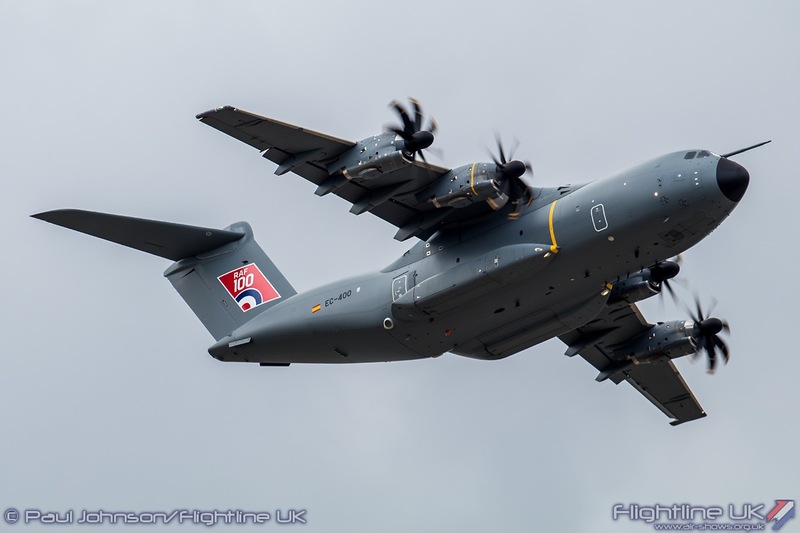 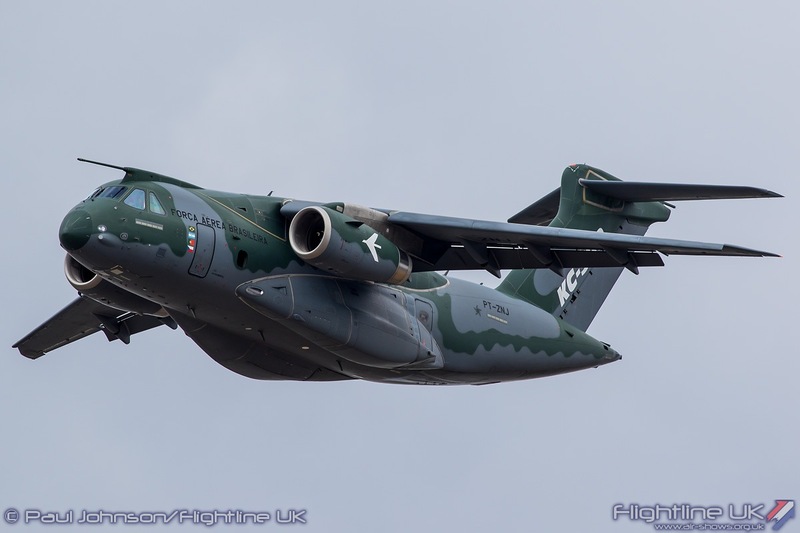 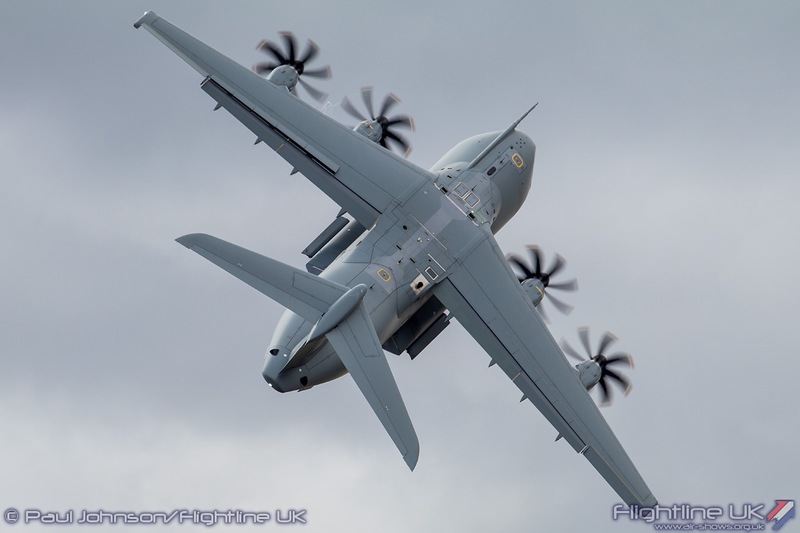 Military airlift capabilities were shown off by the Airbus A400M and the Embraer KC-390. 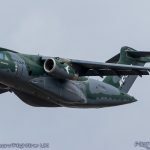 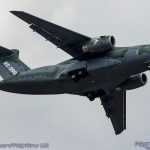 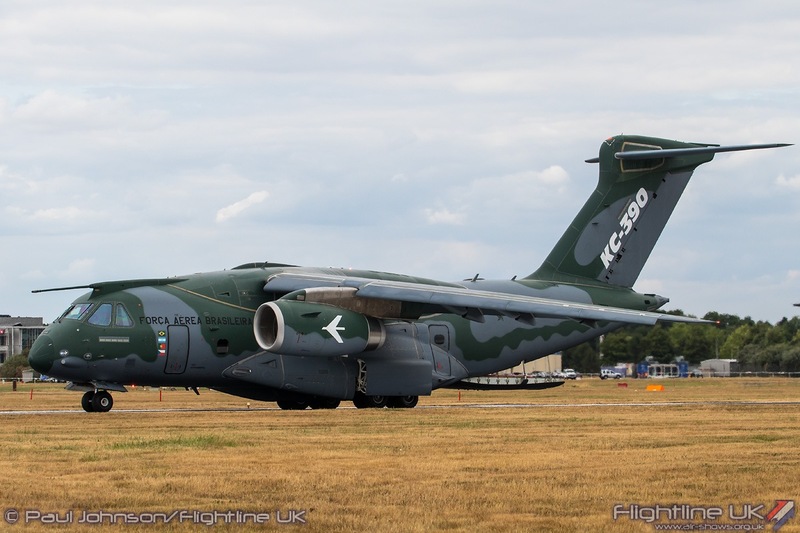 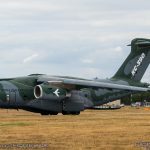 The KC-390 first appeared at Farnborough two years ago on static, but this was if first flying display outside of South America. 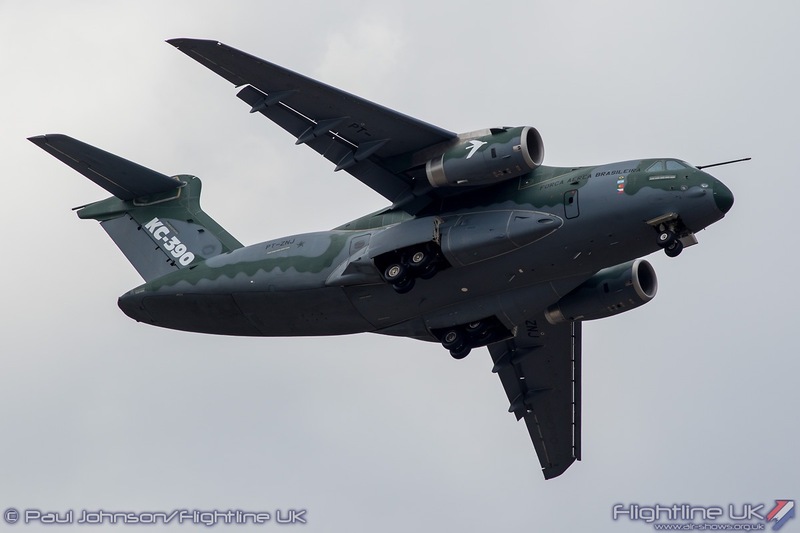 The type will enter service with the Brazilian Air Force as a multi-role tanker transporter and should also see service with the air forces of Argentina, the Czech Republic, Chile and Portugal. 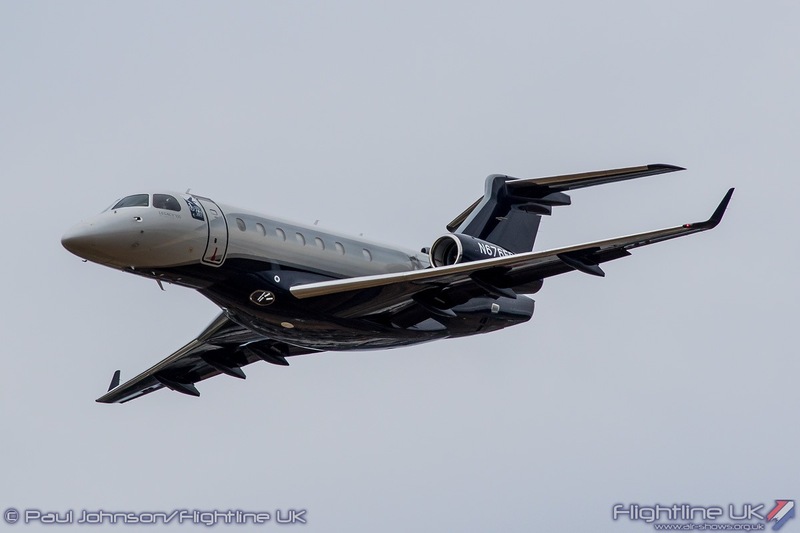 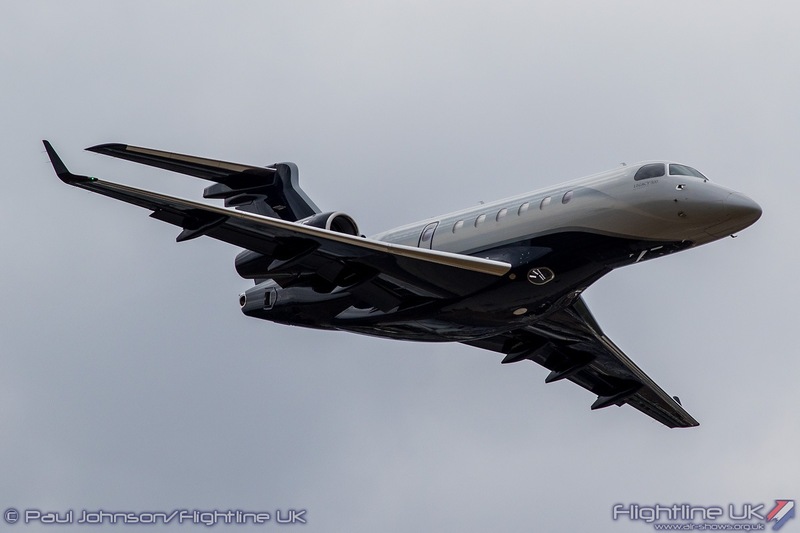 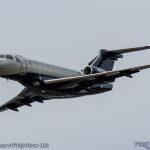 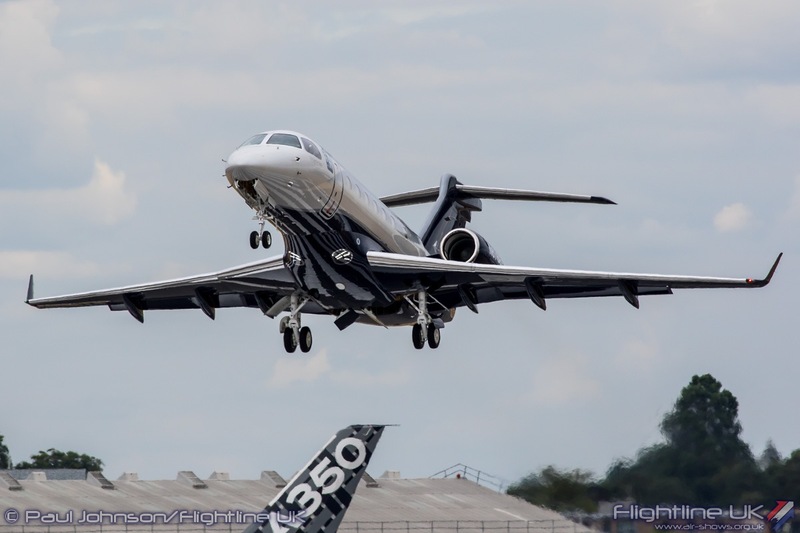 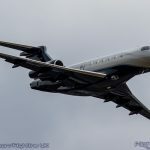 Embraer was also represented in the flying displays by two civilian products, the Legacy 500 business jet and the E-190E2. 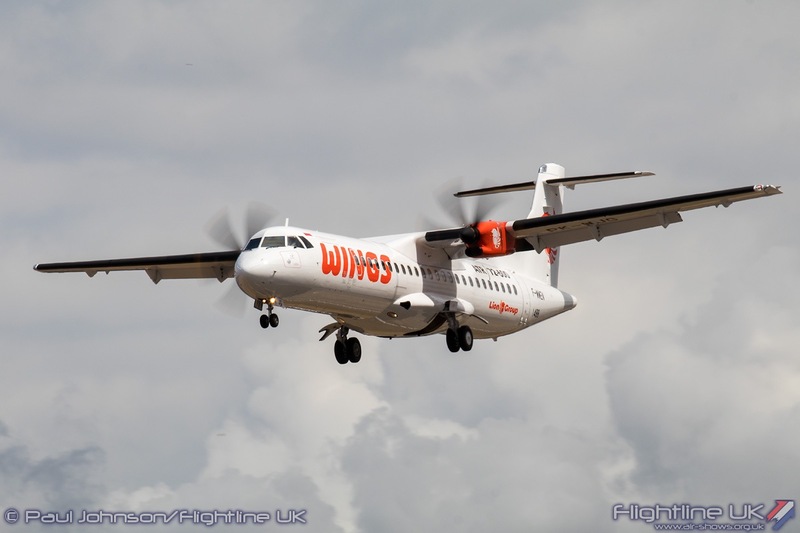 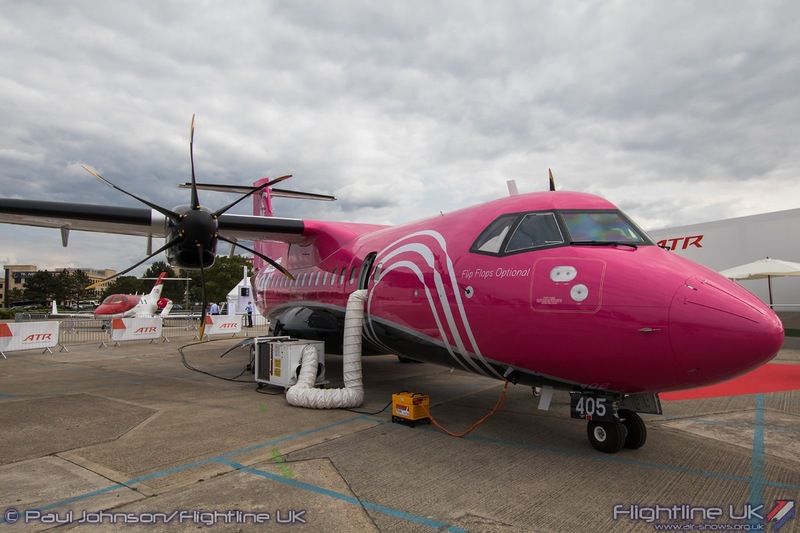 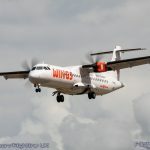 The latter was one of a trio of new regional airliners to feature in the flying display. 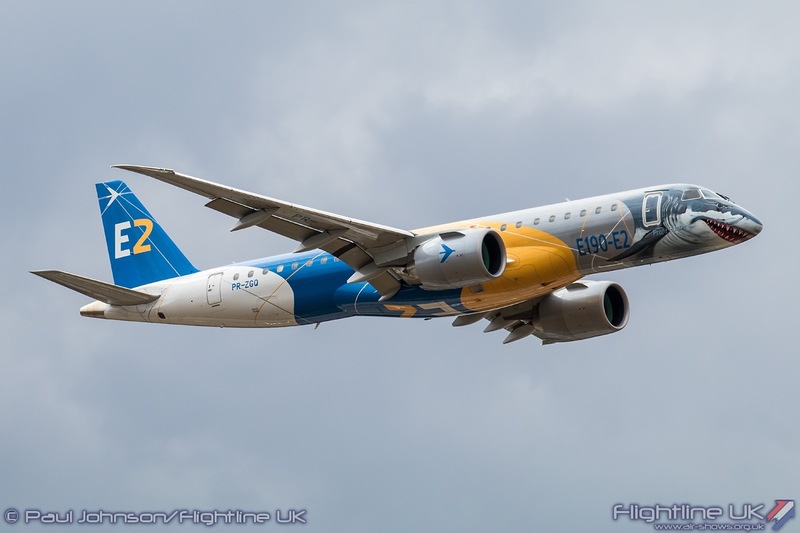 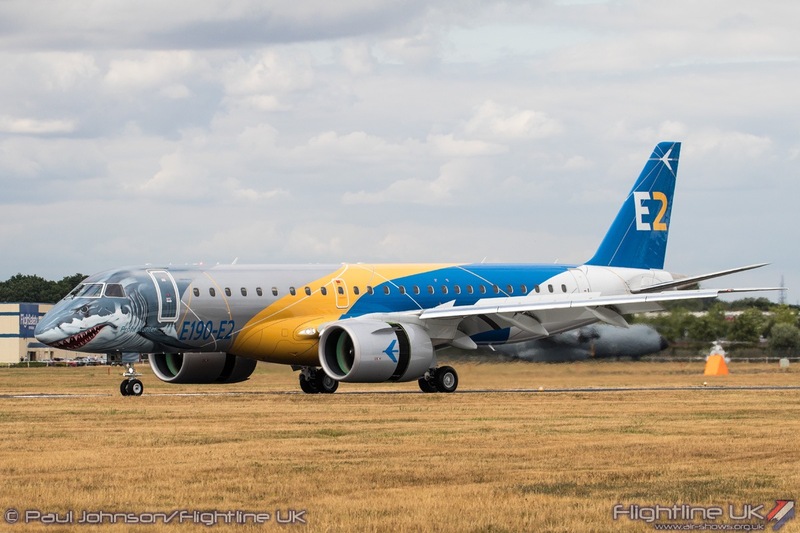 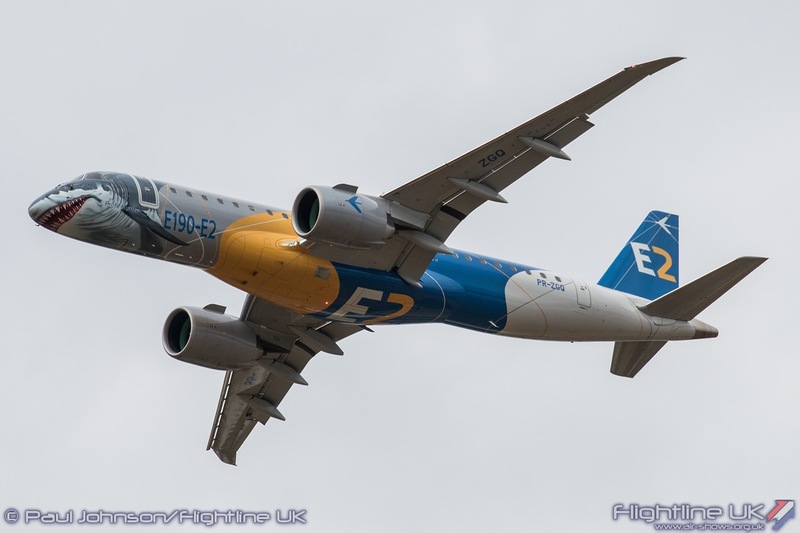 The E2 range from Embraer builds on their successful range of E-jets but introduces new wings, engines and avionics. 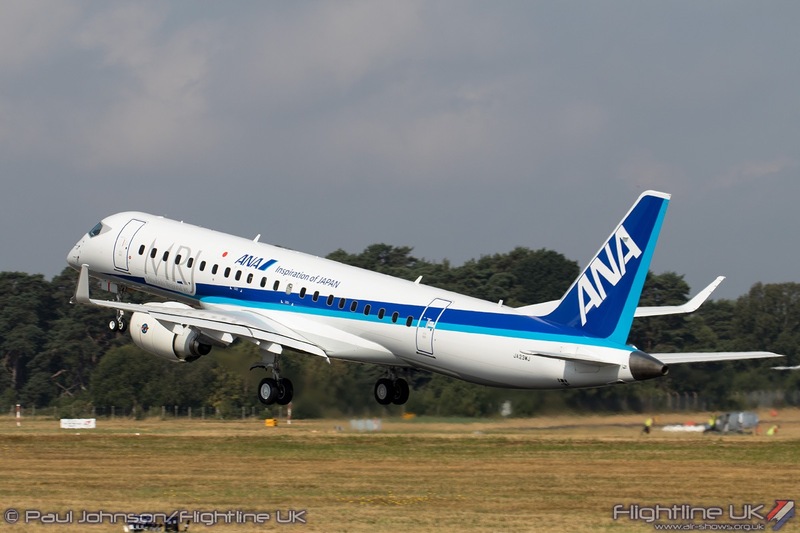 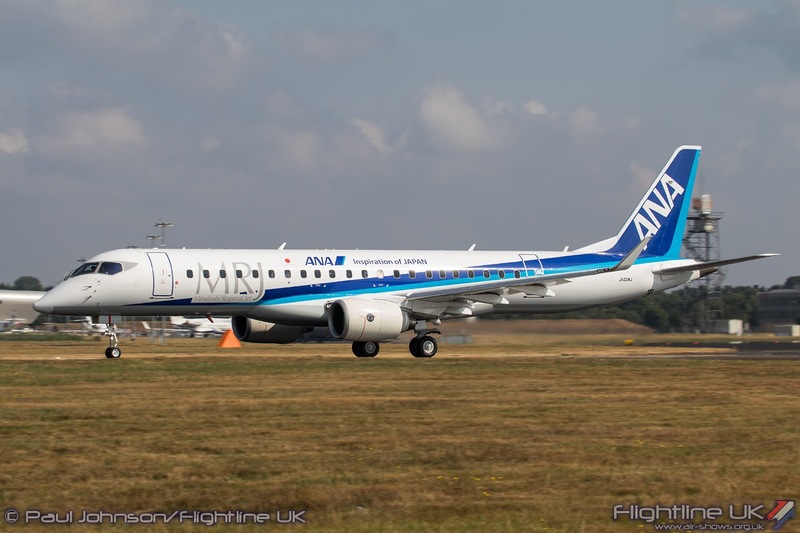 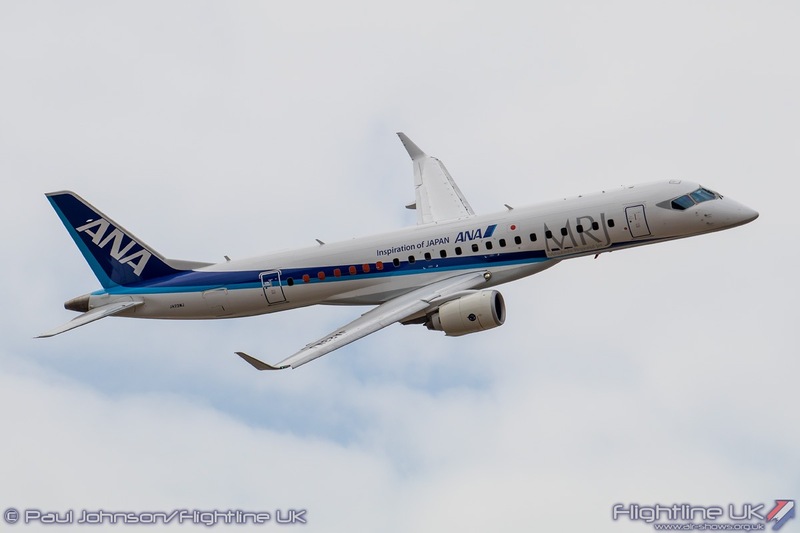 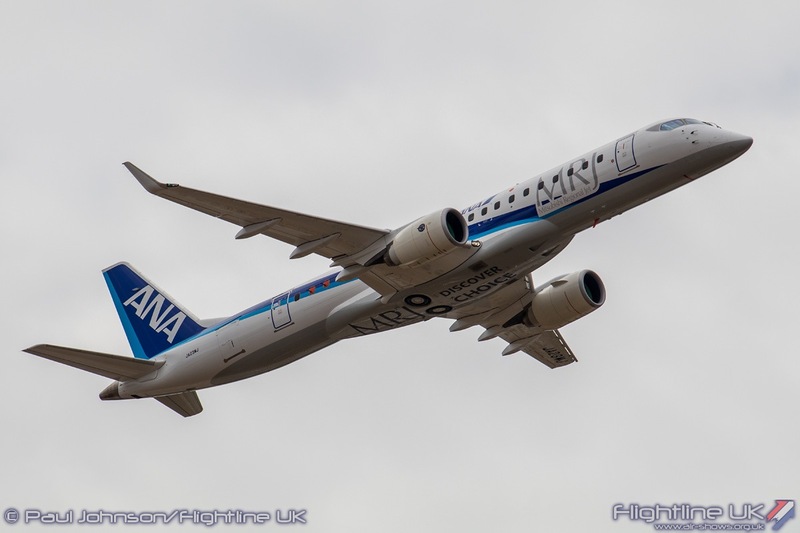 One of the E-190E2’s competitors is the Mitsubishi MRJ90 which was making its debut at Farnborough. 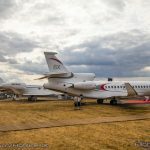 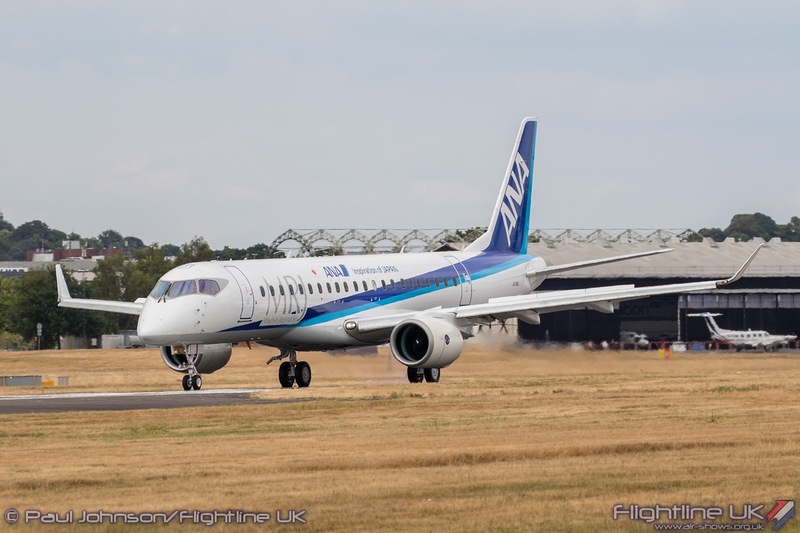 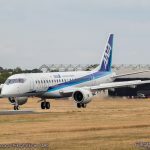 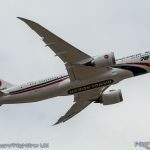 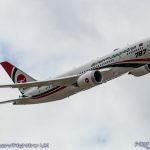 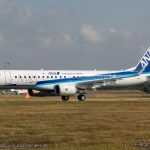 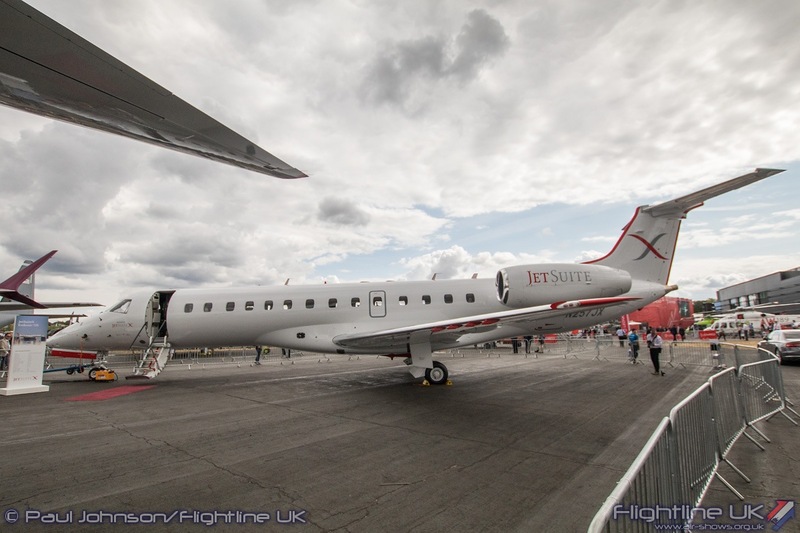 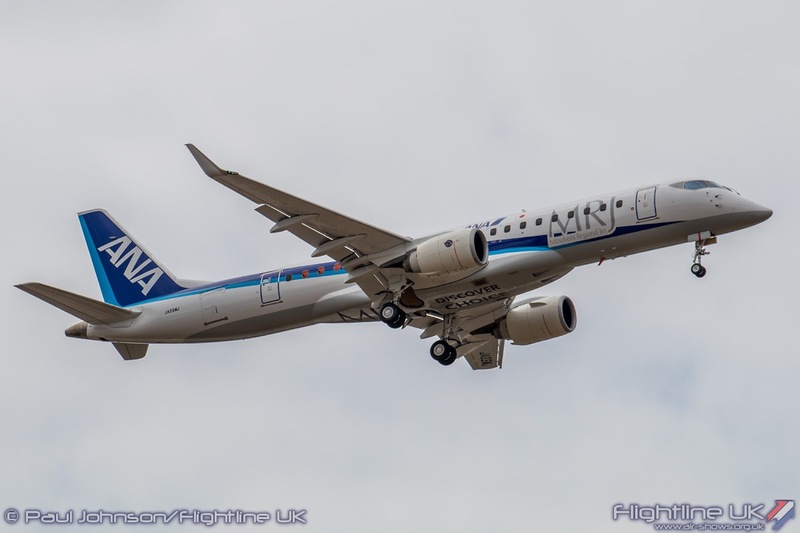 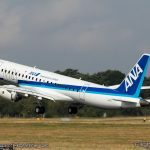 The MRJ team faced a challenging start to their week at Farnborough after their aircraft was struck by a ground handling vehicle after Monday’s display damaging the skin of the aircraft. 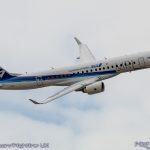 New parts were sent in and the MRJ only missed one display on the Tuesday. 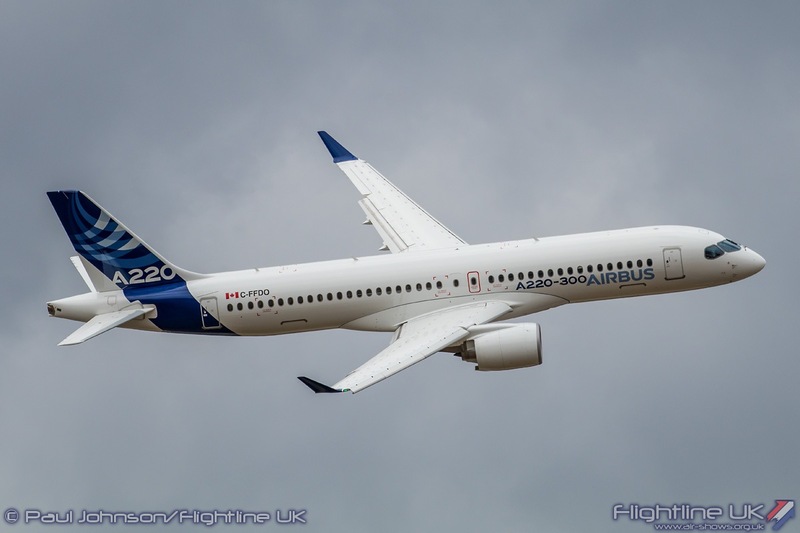 Farnborough also saw the formal adoption of the Bombardier C-series into the Airbus family as it was renamed the Airbus A220. 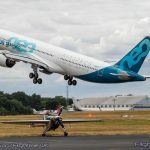 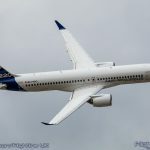 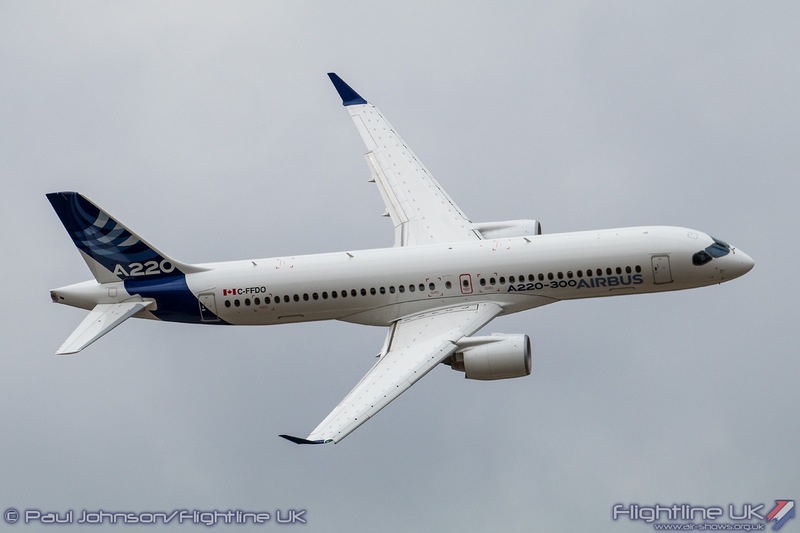 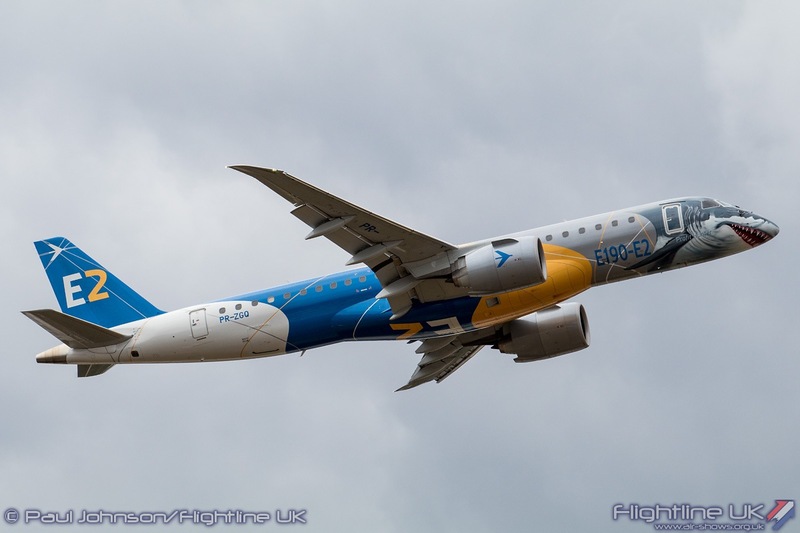 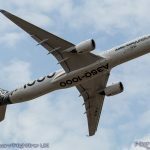 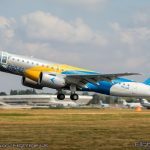 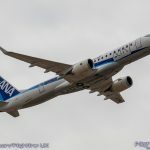 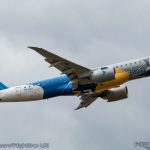 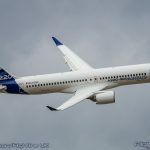 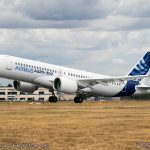 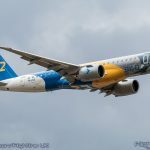 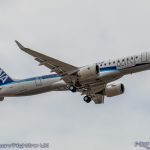 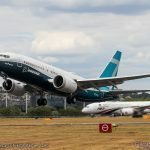 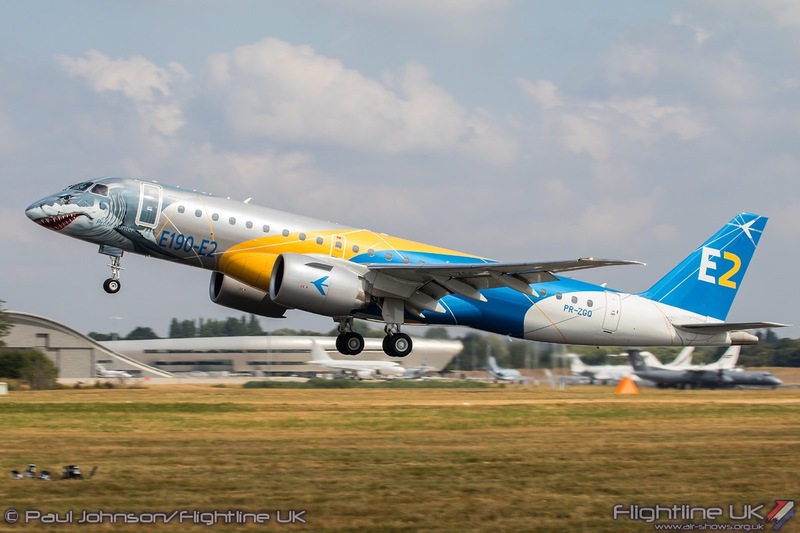 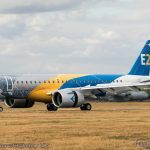 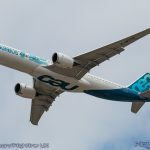 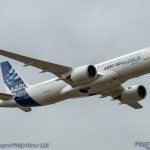 The CS300 now becomes the Airbus A220-300 and was put through an elegant routine during the trade week flying displays alongside more familiar Airbus types. 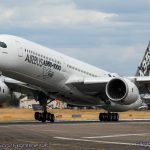 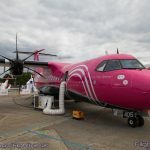 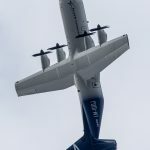 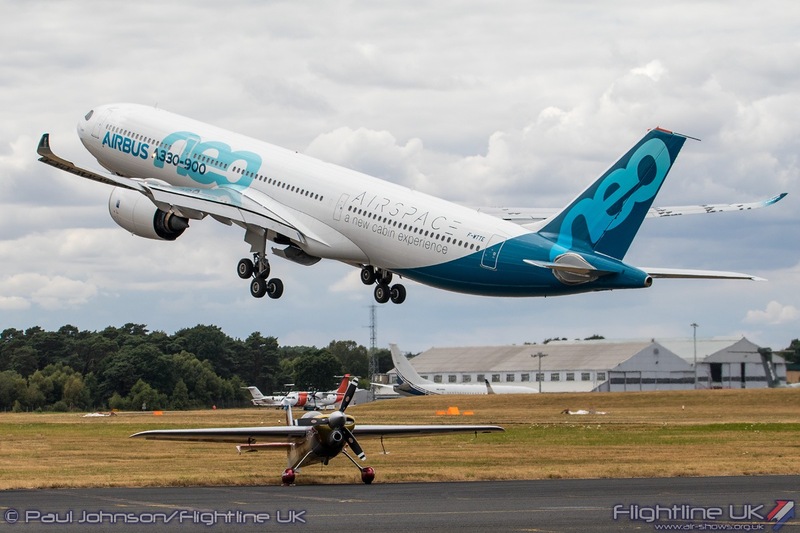 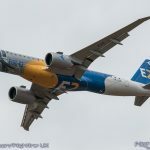 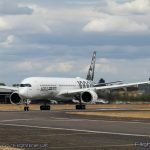 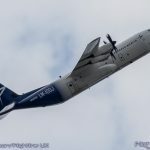 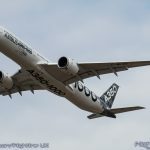 There was no sign of the A380 this year with Airbus keen to show off its long haul twin engine aircraft in the flying and static displays display. 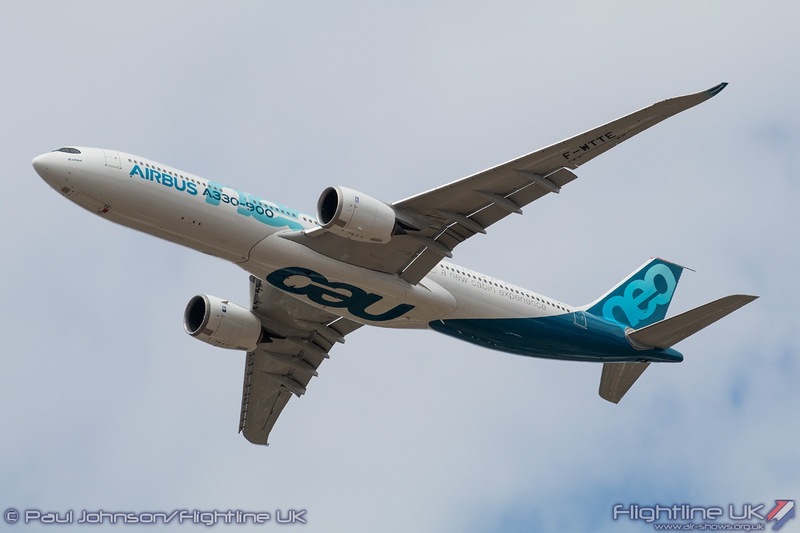 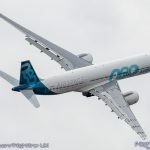 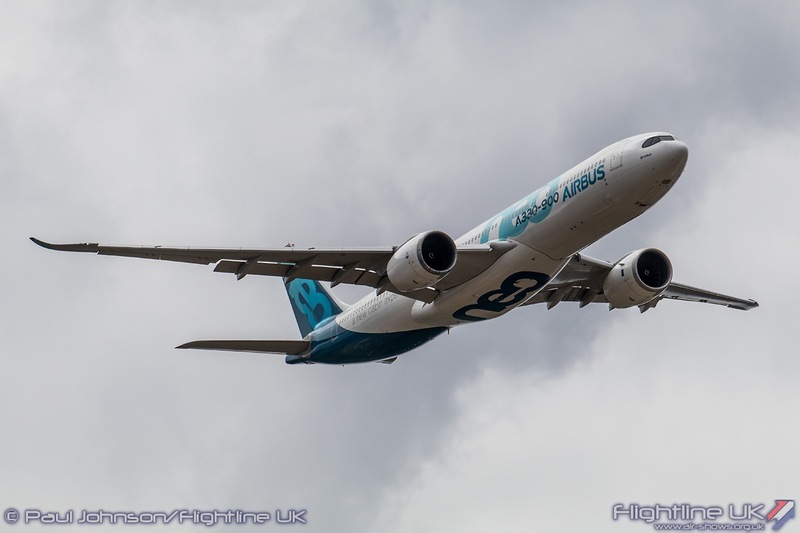 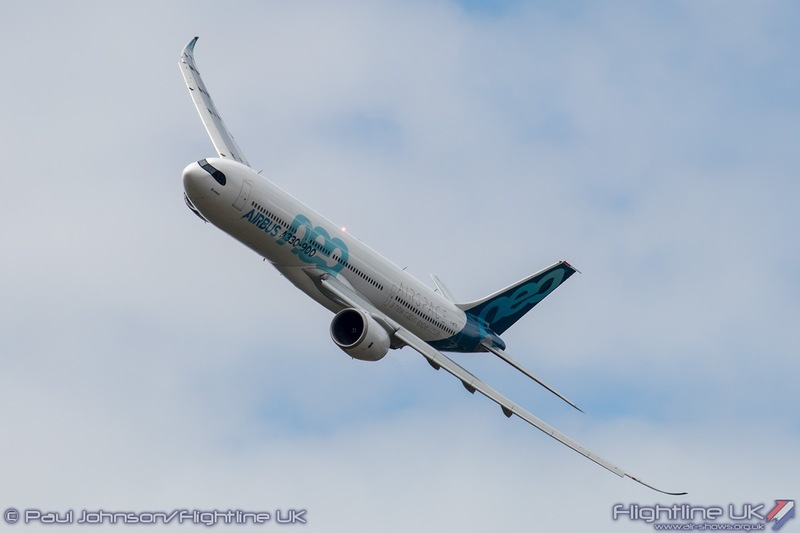 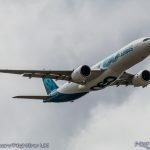 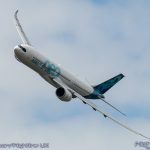 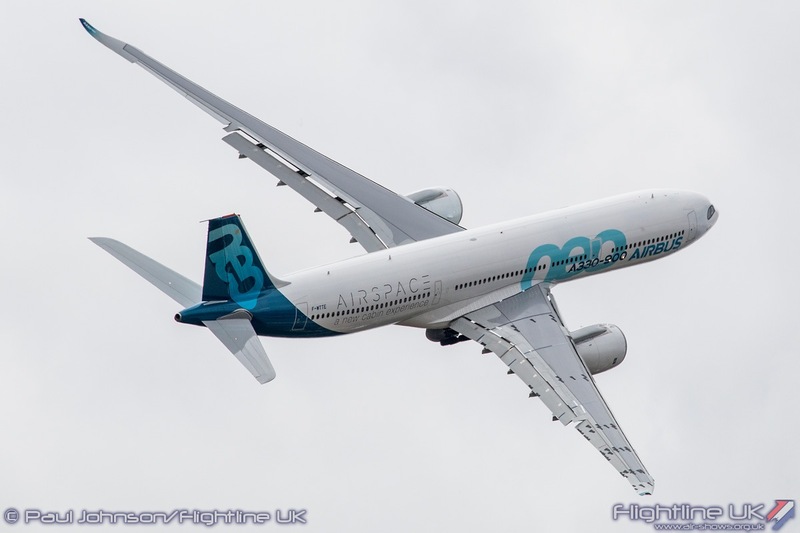 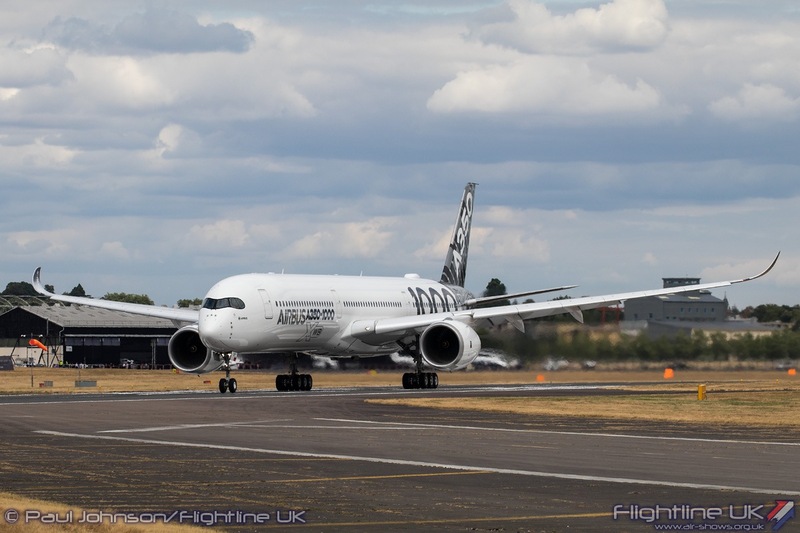 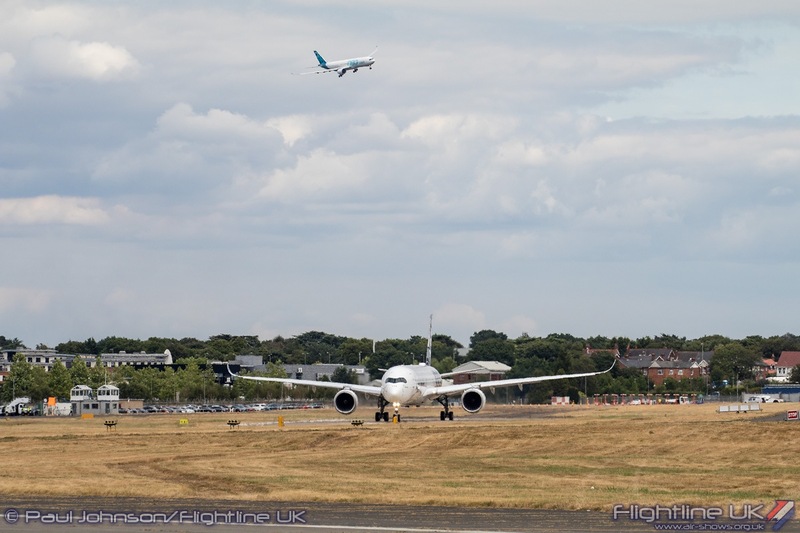 Farnborough saw the debuts of the Airbus A330-900NEO (New Engine Option) and the A350-1000. 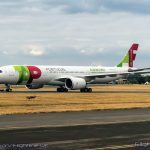 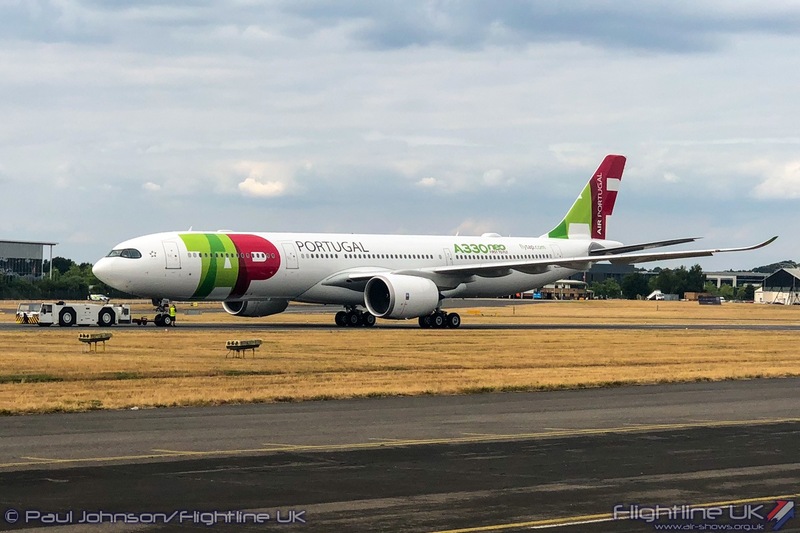 On static display both types were represented by customer aircraft with an A330-900NEO from TAP Air Portugal and an A350-1000 from Qatar Airways. 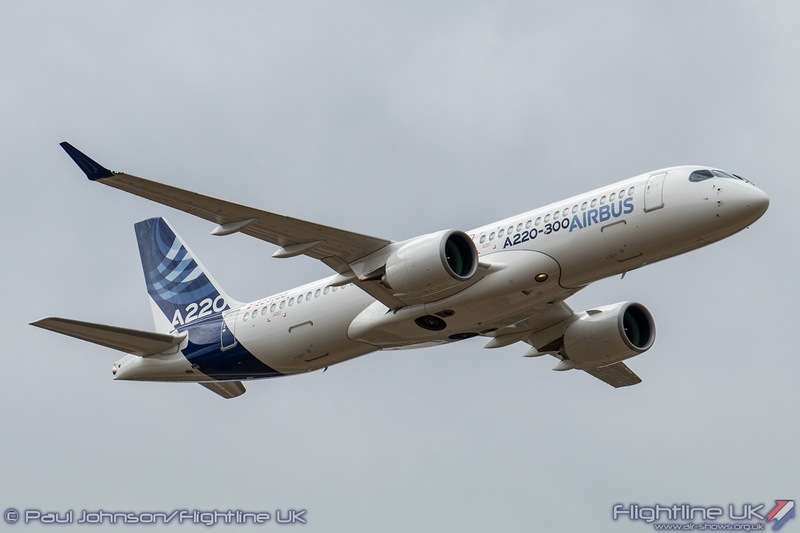 In the air, Airbus’ test and demonstrator aircraft were put through typical dramatic routines. 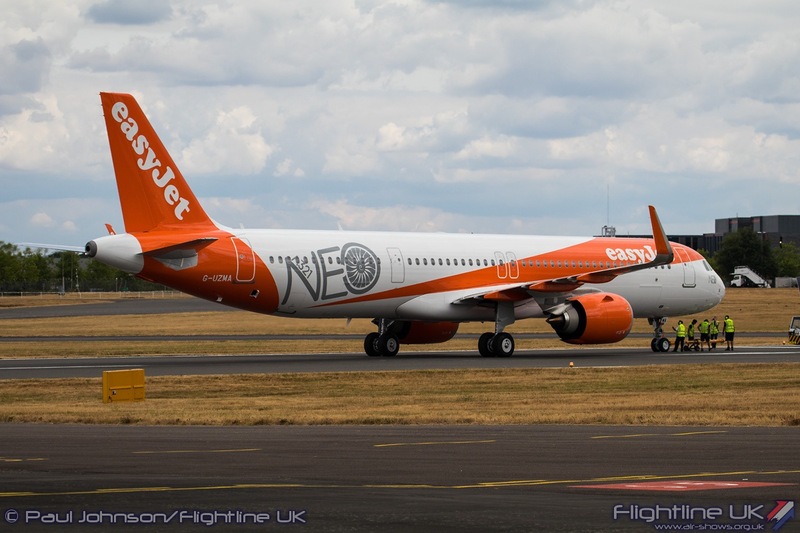 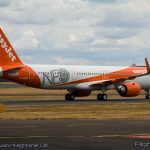 The Wednesday of Farnborough saw a further ‘NEO’ delivered to a customer when Easyjet received its first A321NEO at the show. 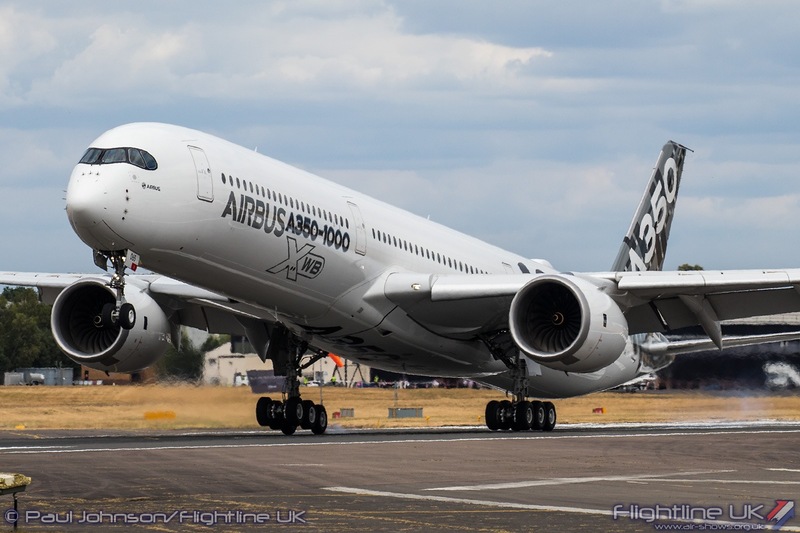 Airbus’ great rival Boeing has an equally large presence during the trade week. 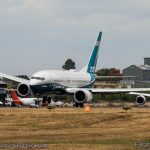 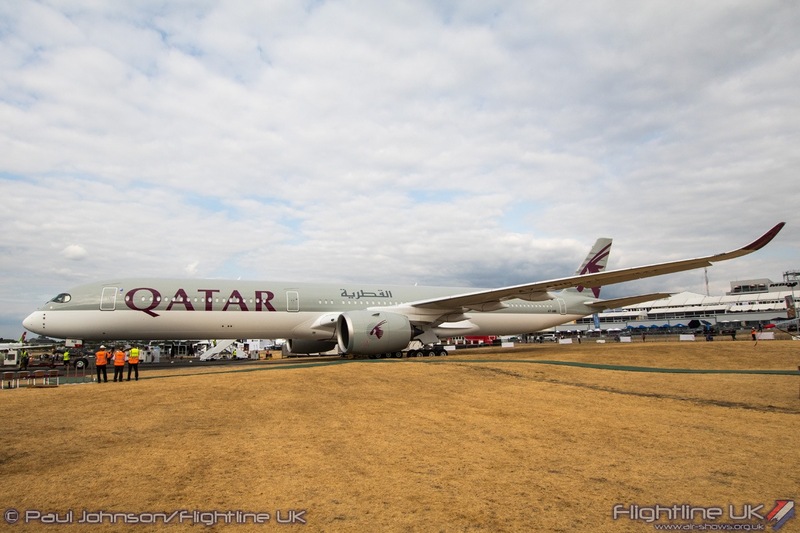 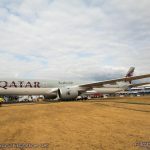 On the ground, Boeing also had help from Qatar Airways with one of their Boeing 777-300ER airlines standing over the static display near Hall 1 next to an Air Italy 737-MAX8. 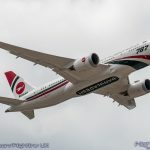 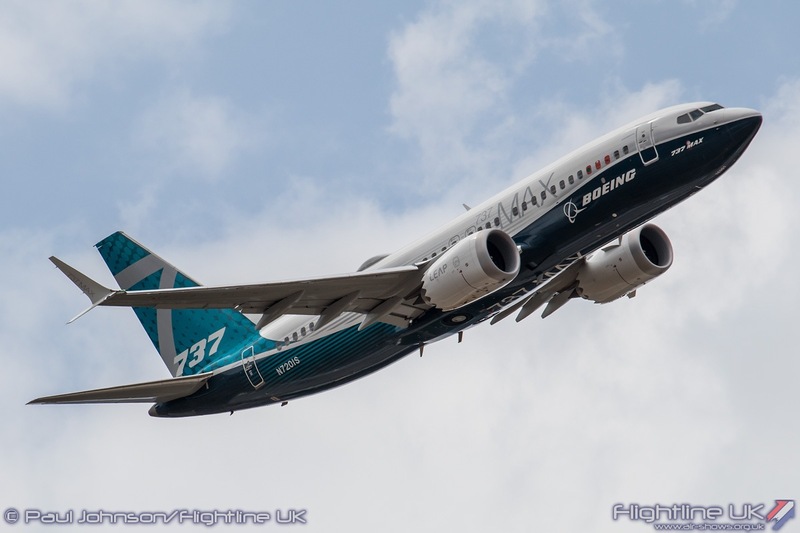 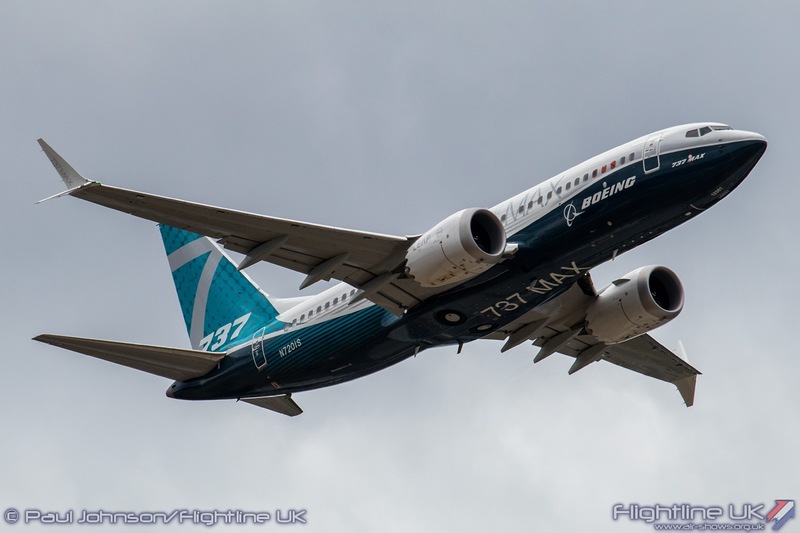 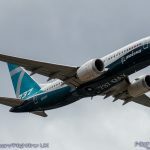 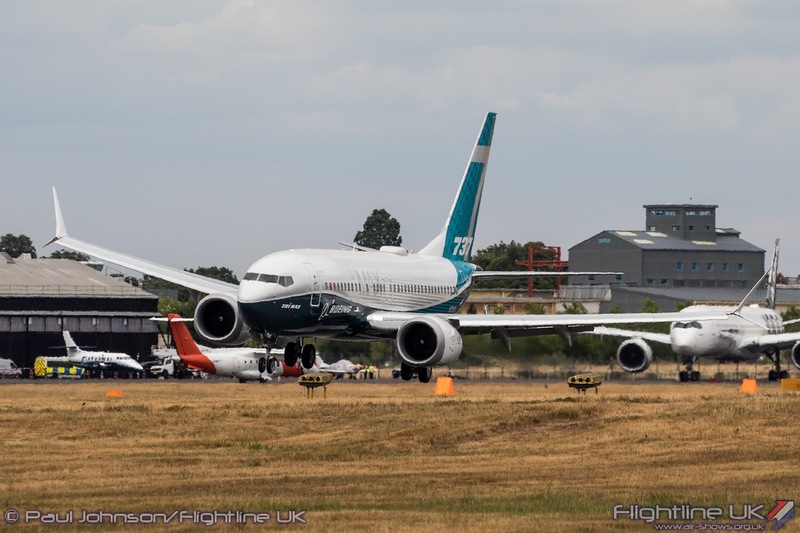 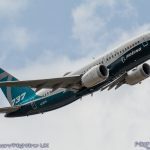 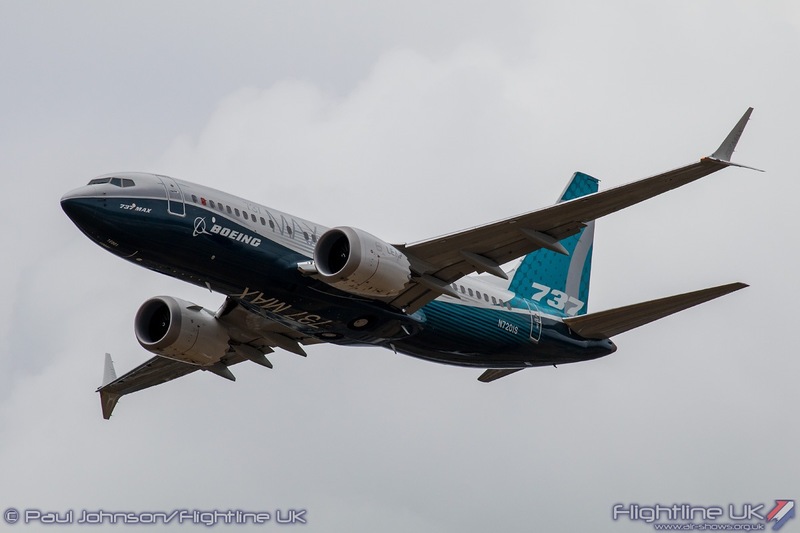 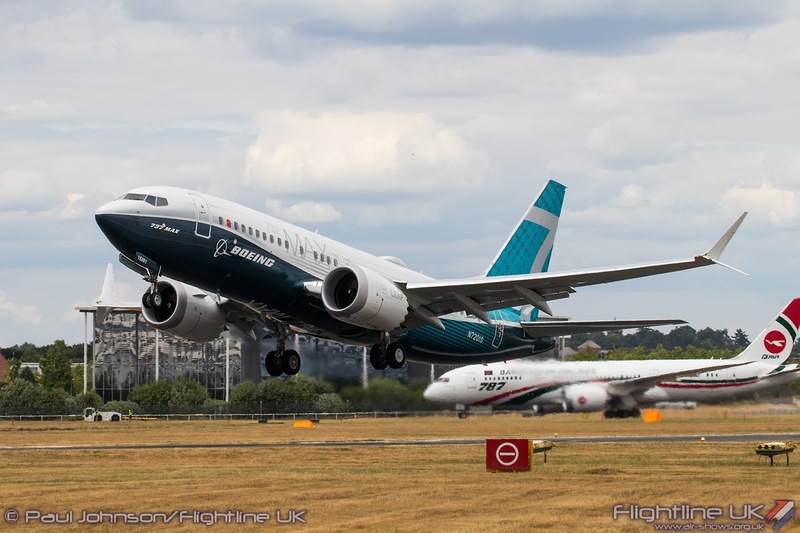 In the air, Boeing displayed both the 787-9 Dreamliner and the 737-MAX7. 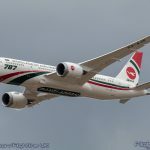 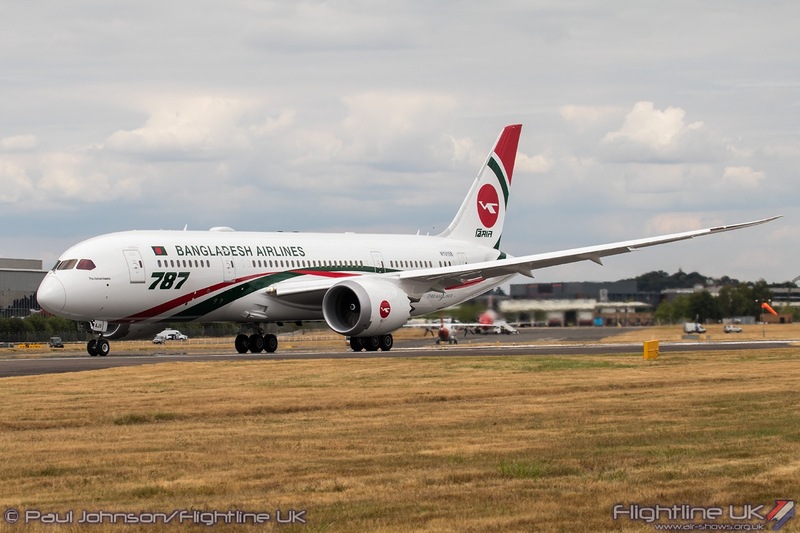 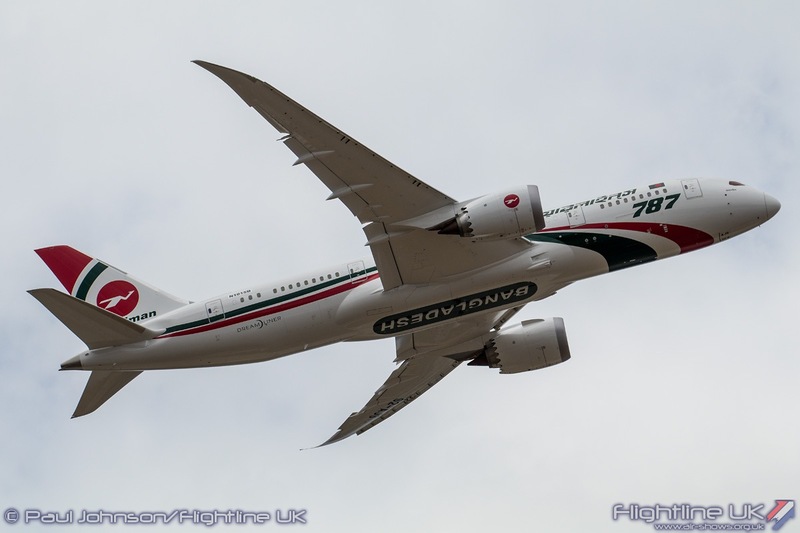 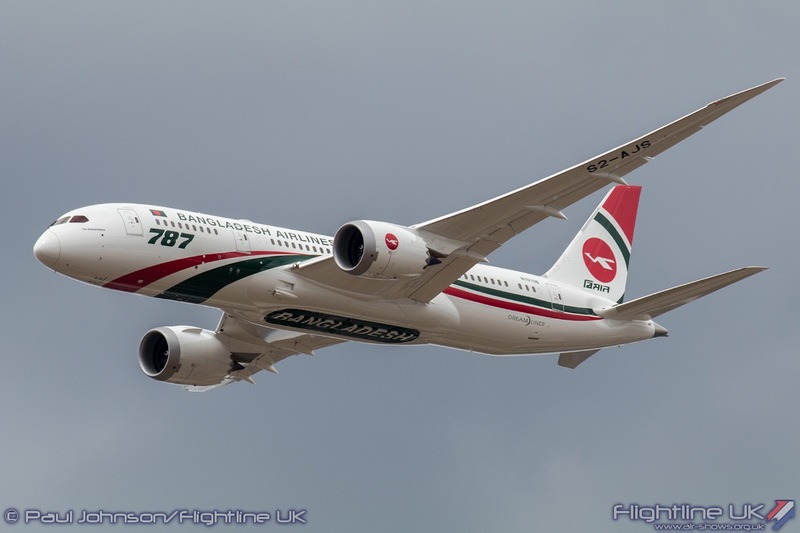 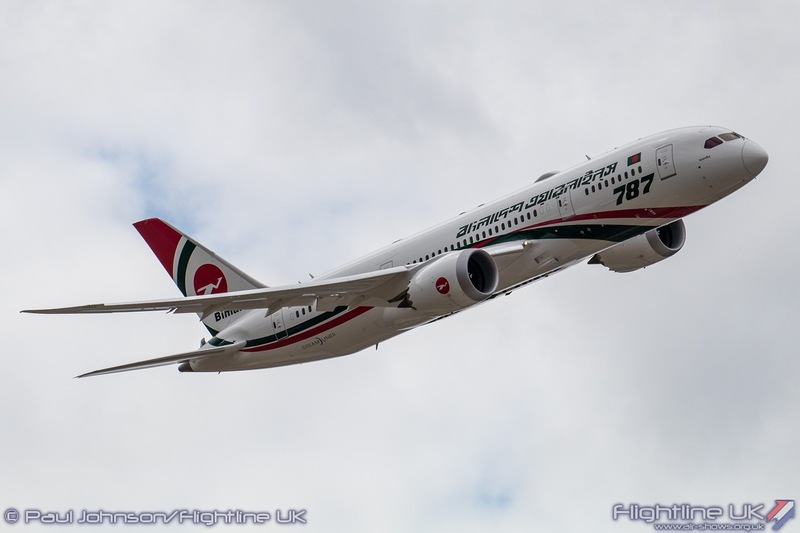 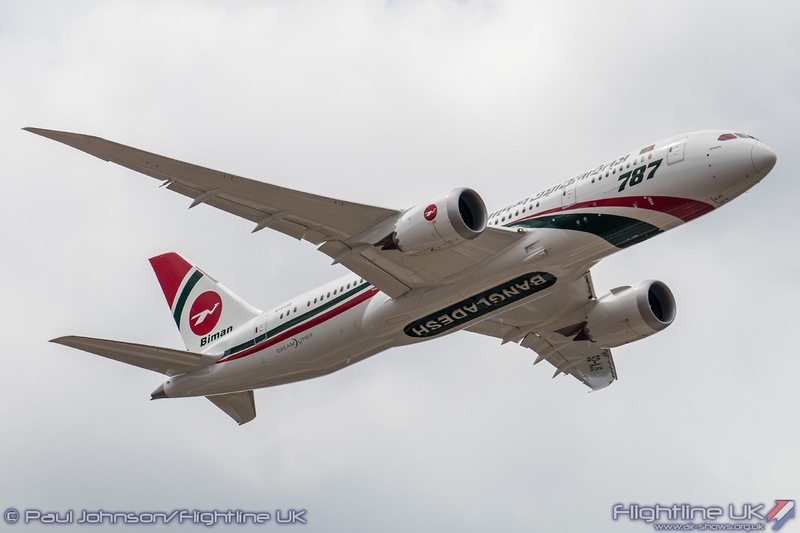 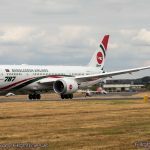 While the 737 wore Boeing’s smart corporate colours, the 787-9 was an example destined for Biman Bangladesh Airlines. 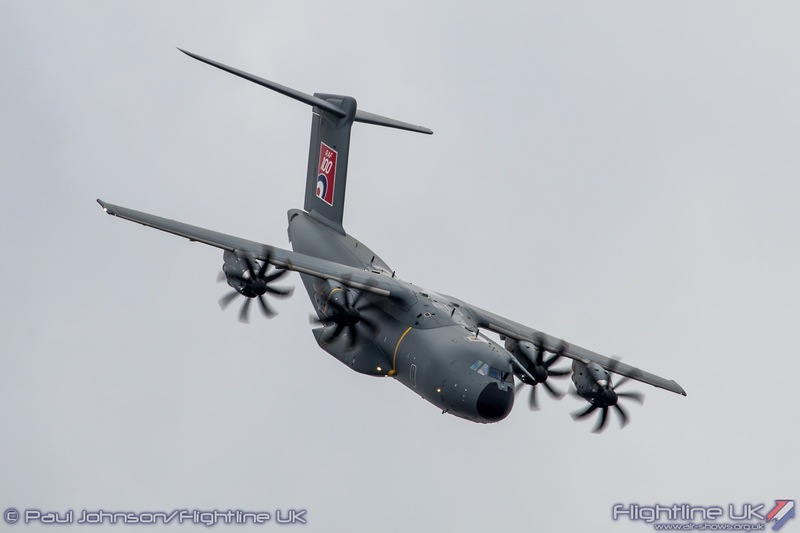 Both displayed remarkable steep climbs after take-off before some sweeping passes along the crowd-line. 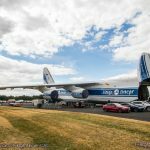 On the ground, Boeing had its own exhibition hall highlighting its contributions to aerospace innovation. 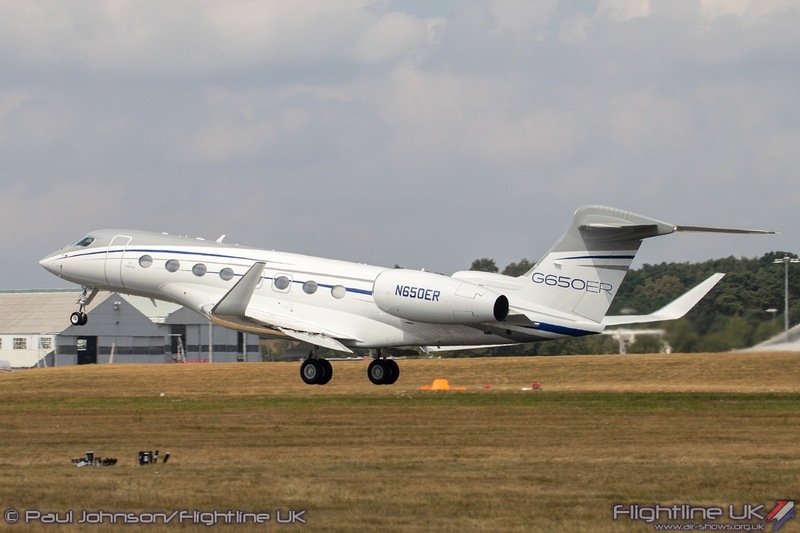 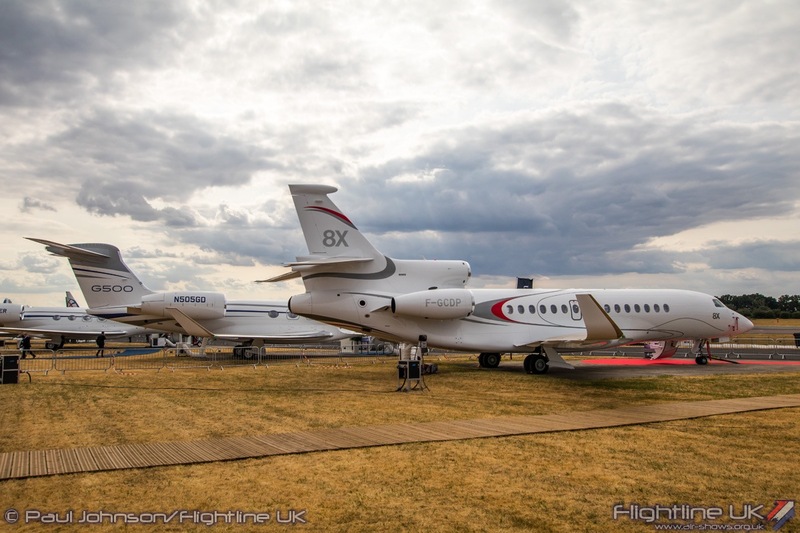 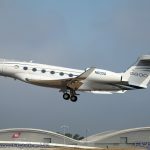 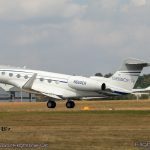 As ever, Business and corporate aviation was a big part of Farnborough with displays from Gulfstream, Dassault and Bombardier. 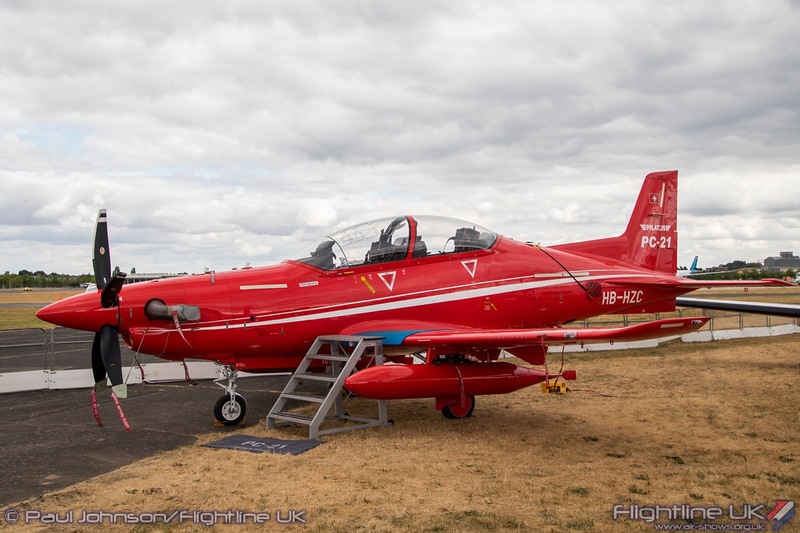 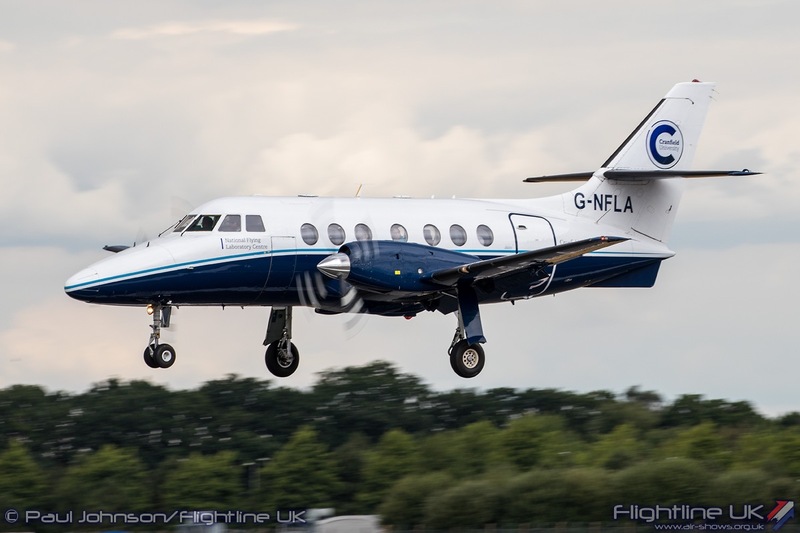 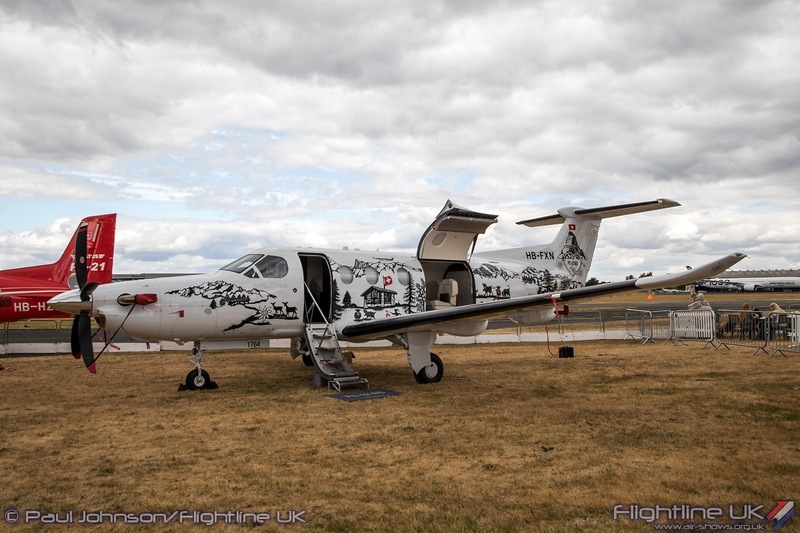 Pilatus too returned with a PC-12NG alongside their PC-21 military training aircraft. 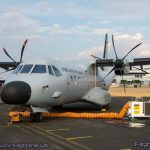 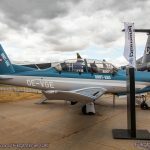 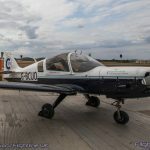 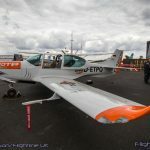 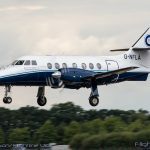 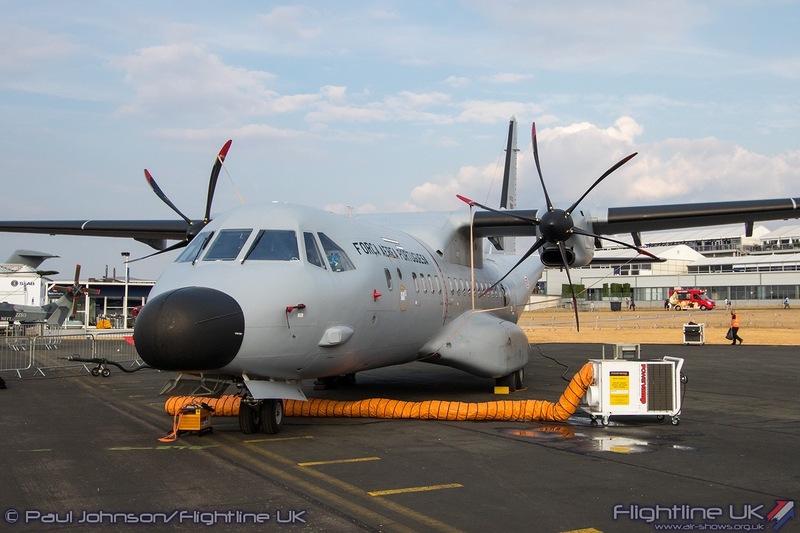 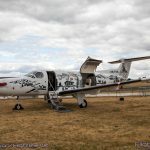 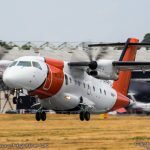 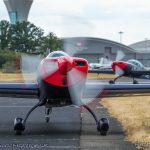 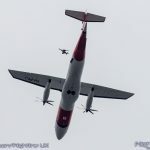 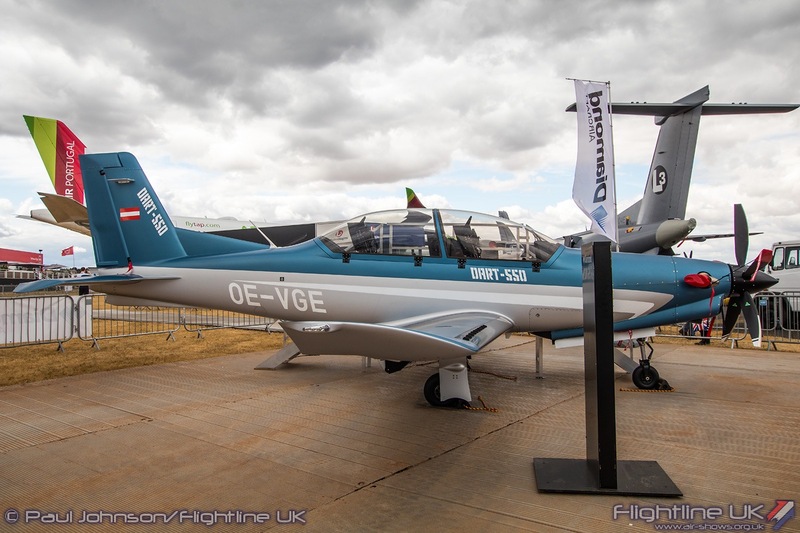 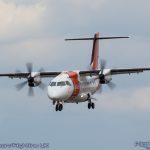 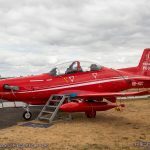 Austrian company Diamond too had a number of aircraft on show with various derivatives of the Twin Star on show as well as the Dart 550 aerobatic turboprop training aircraft. 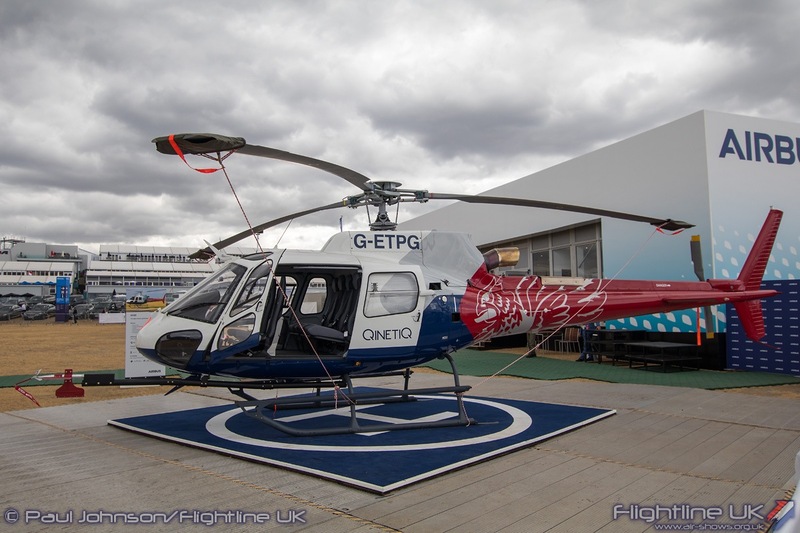 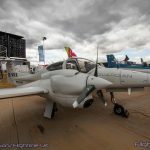 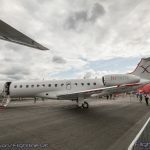 2Excel Aviation had a major presence at the show showcasing the various activities they are involved with. 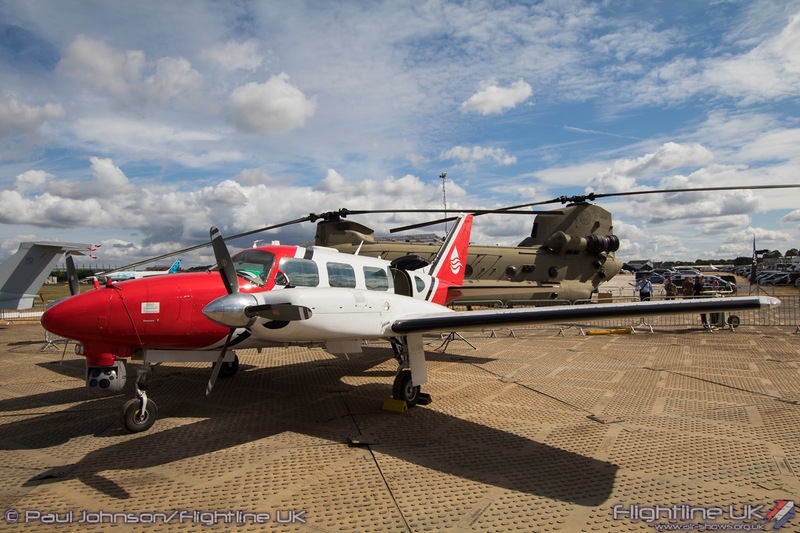 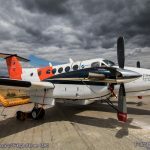 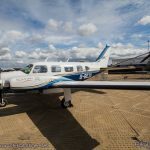 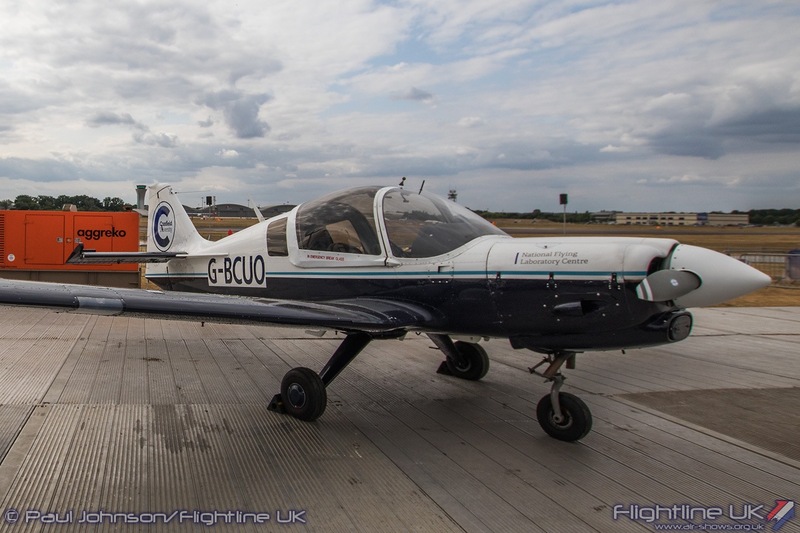 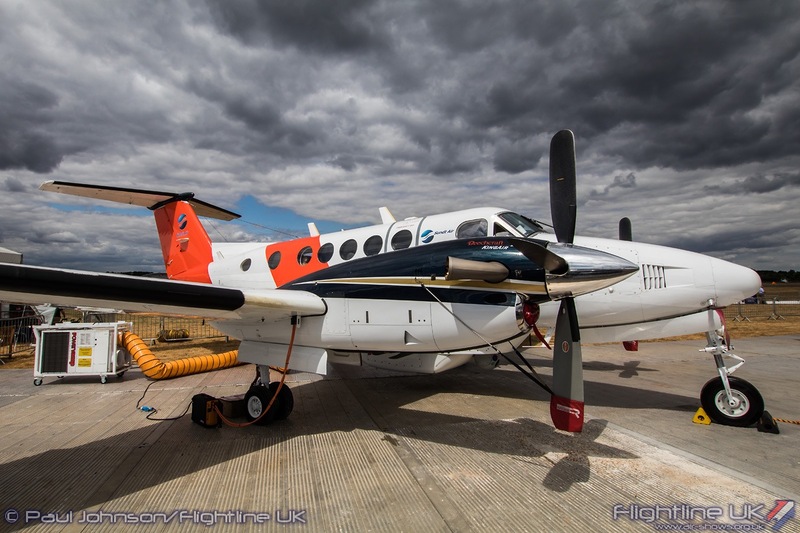 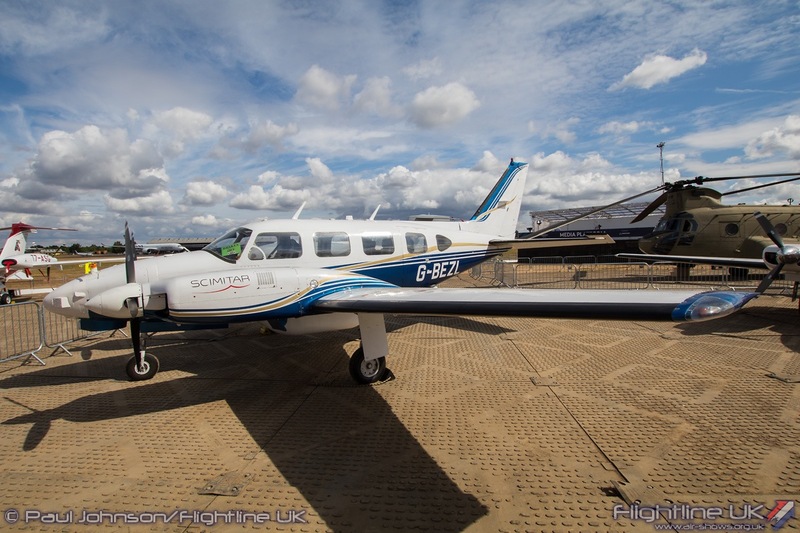 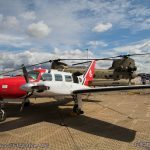 2Excel’s Scimitar arm was represented in the static display by one of their Piper PA31 Navajo which are used for wide range of research and development tasks for military, government and industrial customers including Oil Spill Response. 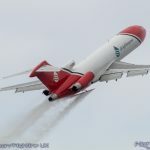 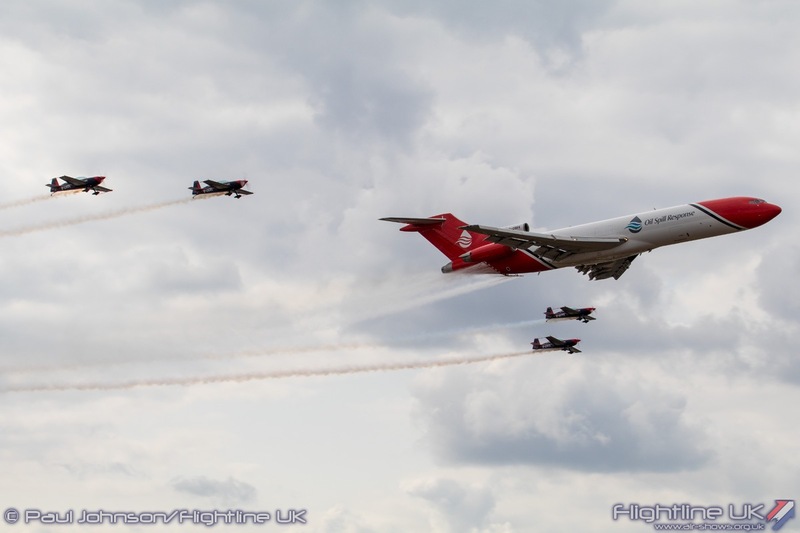 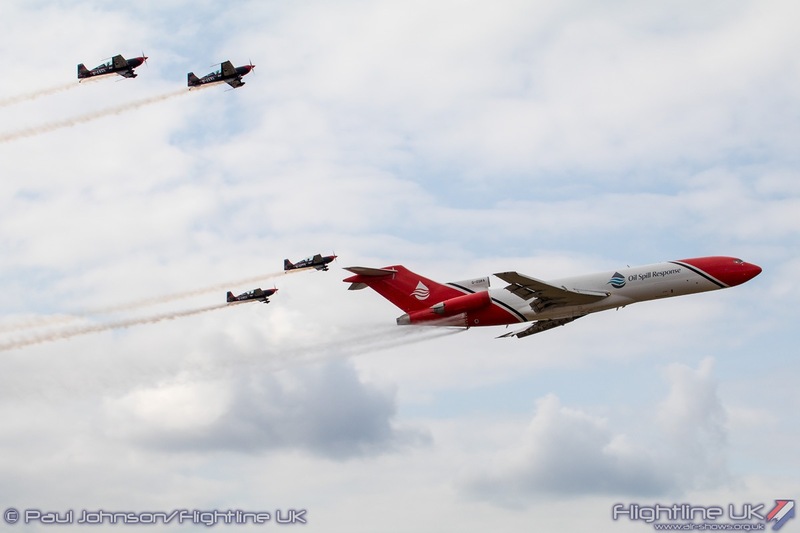 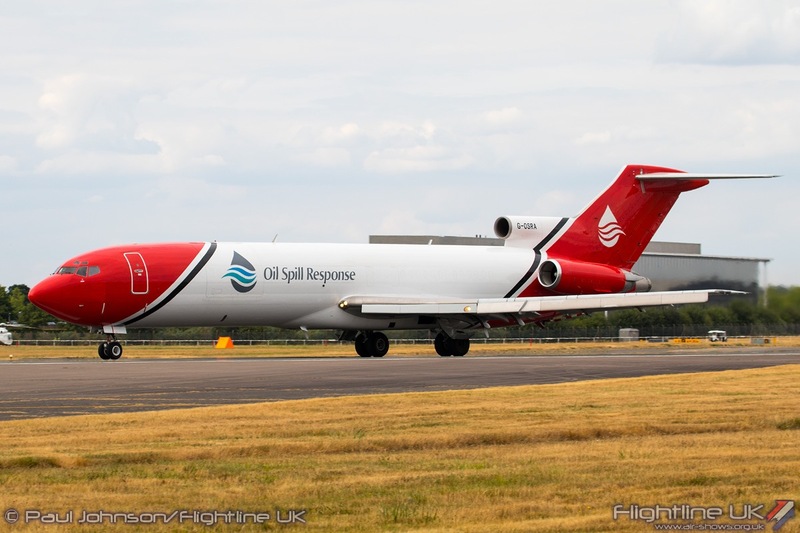 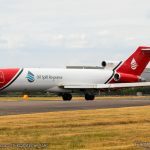 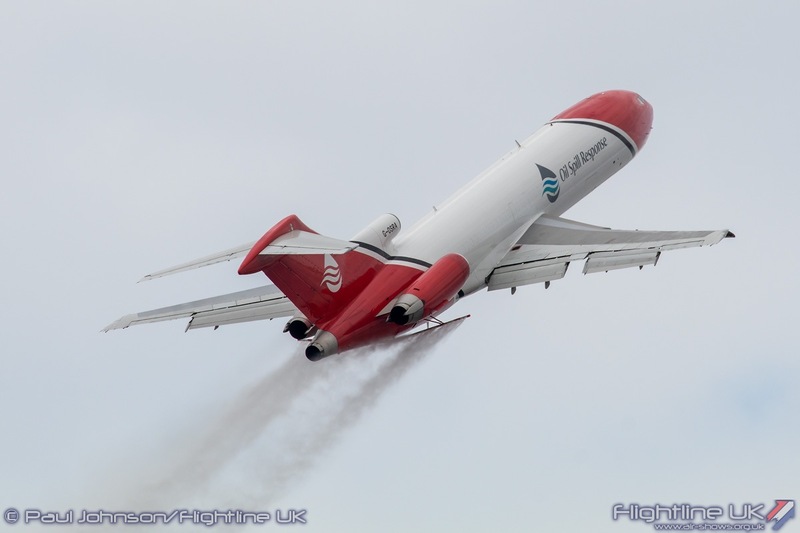 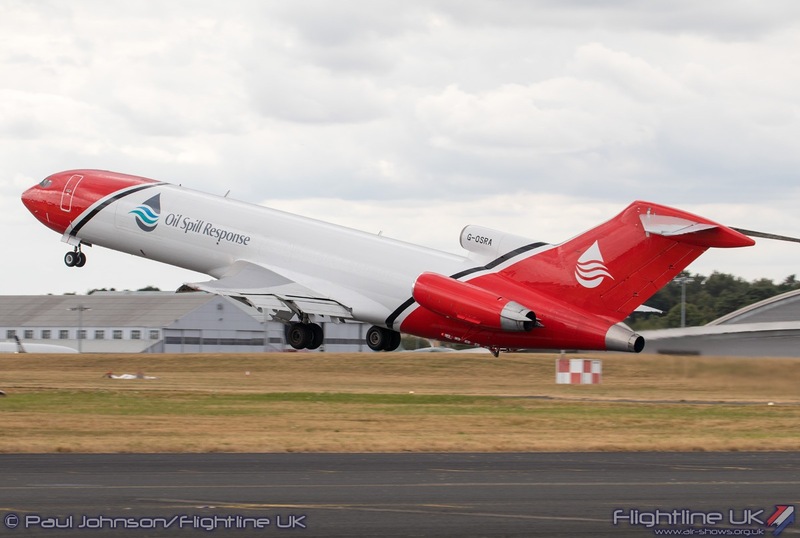 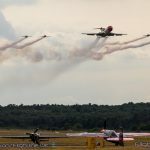 They also closed each day’s flying display with a spectacular simulation of oil-dispersant spraying from one of their Boeing 727-2S2s in formation with the Blades Aerobatic Team. 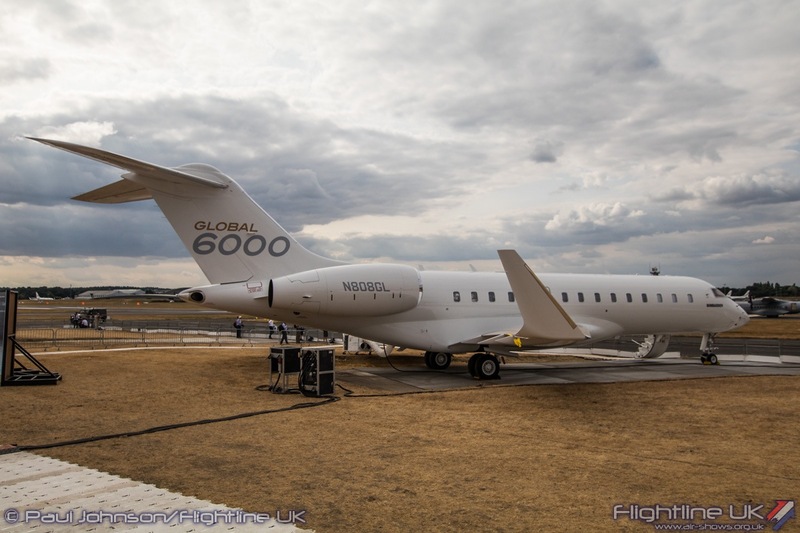 It is good to see Farnborough International continuing to invest in the Farnborough site. 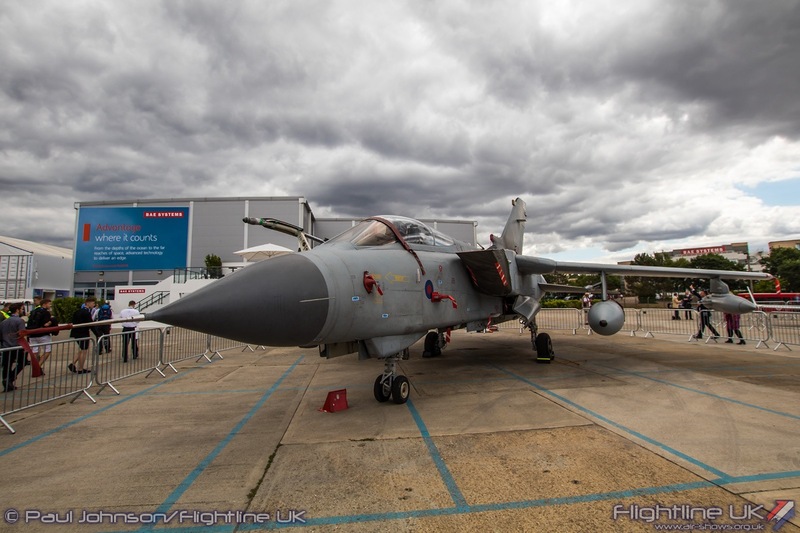 The new Hall 1 really is a vast improvement on the old temporary structure and will also serve an a year round exhibition space for other events. 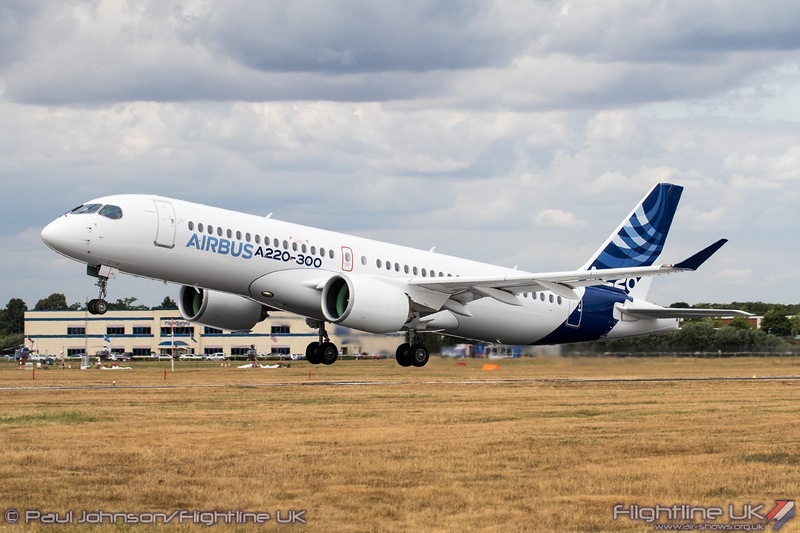 Long may Farnborough, the birthplace of UK aviation, play a pivotal role in the global aerospace industry.